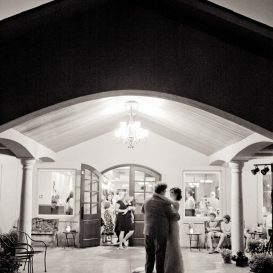 Photography by the wonderful Stephanie Susie of Stephanie’s Photography. See more of her work, here. I woke up at my parent’s house that morning at around 6 am. My dad had a quick chat with me about the ceremony plans and then I washed my face, brushed my teeth, and grabbed my travel bag with my essentials in it and headed to town to meet Drew for a super quick breakfast before my hair appointment. We exchanged gifts with each other and talked about how excited we were. I had to rush out before I even had time to eat much because I was already late for my hair appointment. I got my hair done, then met my two younger sisters, Kelsey and Jillian, and my two best friends, Tonya and Jessica, at Dream Baskets in town. The girls had grabbed the box of sandwiches/chips/cupcakes from Julie (of Dream Baskets who was catering our wedding) for our lunch and then we headed out to the winery (Bella Terra Winery in Creal Springs, IL about an hour from our hometown) in a long caravan. 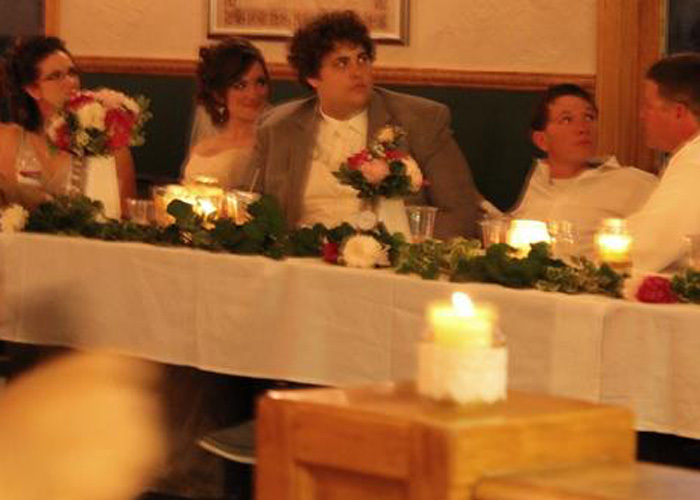 I was driving Mom’s minivan loaded completely full of all the wedding decor and accessories. 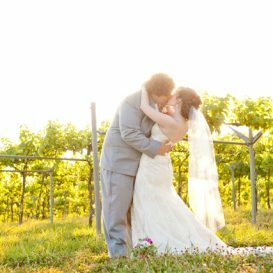 The girls and I spent the rest of the morning decorating the winery–moving tables, putting out tablecloths & burlap table runners, filling glass jars with sand and candles, setting up the marriage advice/sign-in table, hanging curtains on the pergola, etc. Drew’s parents, two of his nephews, Taylor and Bryce, and my cousins Rick, Neva, and Gail all came out to help. Once decorating seemed under control, the girls and I went downstairs to do our make-up and finish getting ready (Blair and Evie showed up around then). Drew and the groomsmen showed up at some point around then too and spent a lot of the morning drinking and playing bocce ball outside. The guys went downstairs to get ready while the girls were taking pictures outside. After all the bridesmaids and groomsmen photos were taken, Drew and I had our “first look” photos. 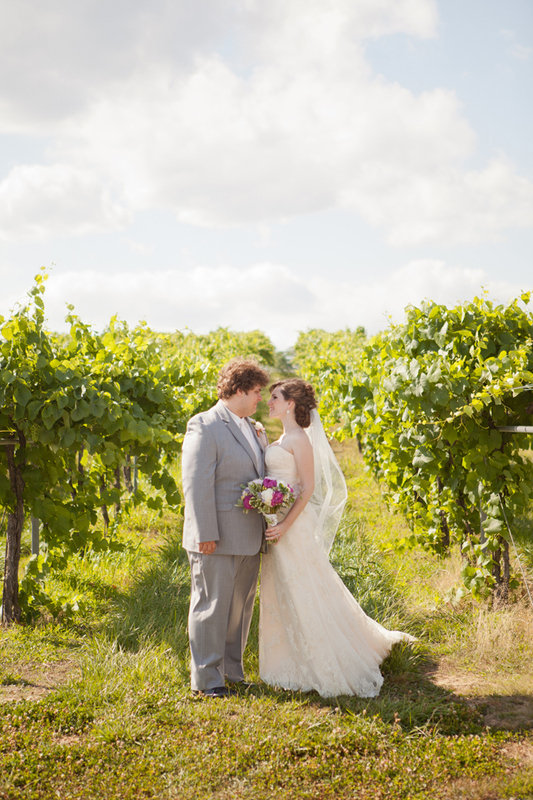 I’m so glad we did photos before the wedding because the winery wasn’t a huge space and it was hard to hide from each other. 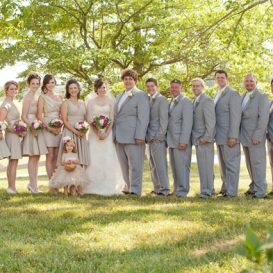 It was also really nice to do all of the bridal party and most of the couple photos earlier in the day so that we didn’t have to worry about taking pictures after the ceremony while guests were waiting on us. 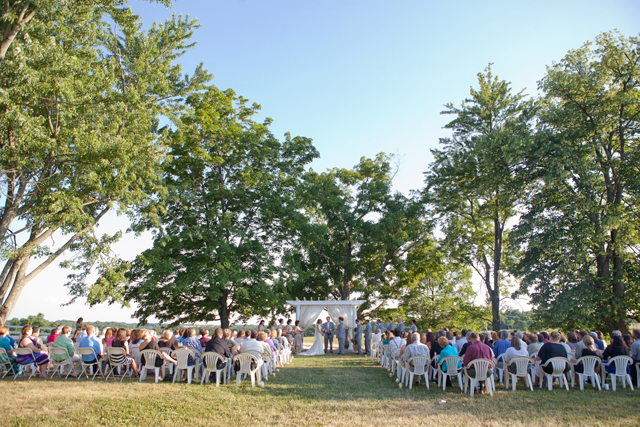 Our wedding ceremony wasn’t until around 6:30 at night, so if Drew and I hadn’t seen each other beforehand we would have barely seen each other at all on our wedding day. 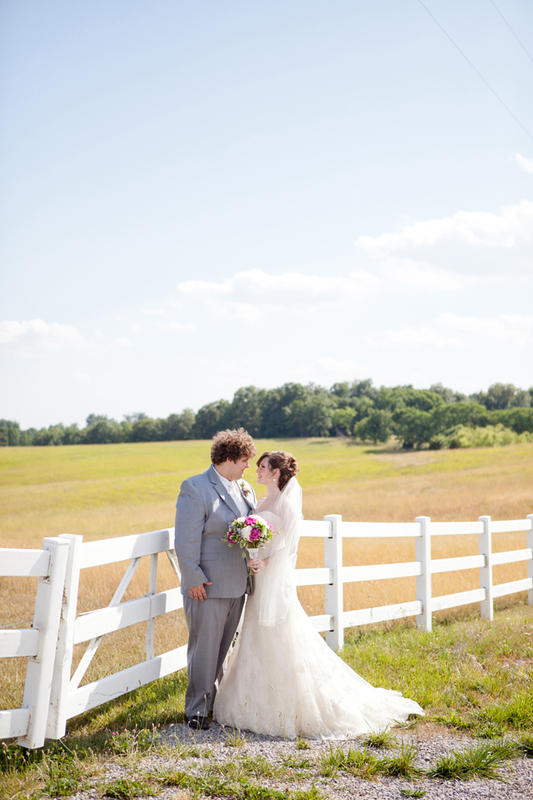 The weather was absolutely gorgeous and the temperature was perfect (it was in the 70s). 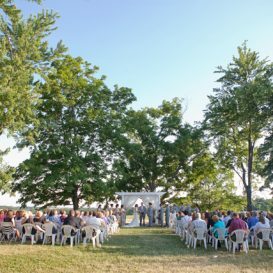 The ceremony was so beautiful and meaningful. 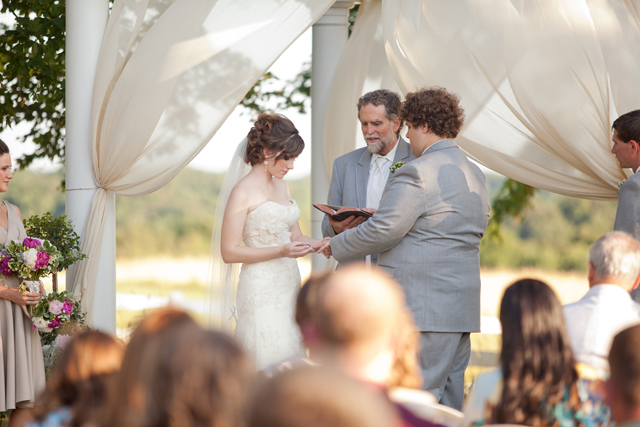 My grandpa walked me down the aisle and my dad officiated the ceremony and told funny stories about us. Afterwards we took a few more photos as the sun set while everyone else started eating. Our food was fabulously done by Julie Kuppart of Dream Baskets and was a buffet consisting of some of our favorites: stir-fry chicken and vegetables, fettuccine Alfredo, Texas potatoes, several different salads, rolls, and an assortment of cheeses, veggies, and fruits. Our cake was simple (four tiers with loosely frosted white icing with fresh peonies stuck into it) and was made of several different flavors–chocolate, lemon with raspberry filling, white with strawberry filling, Italian creme cake, and Drew’s favorite marble cake. I had pre-made gallons of banana punch to be served with it. We also had the bar open serving lots of wine and sangria. 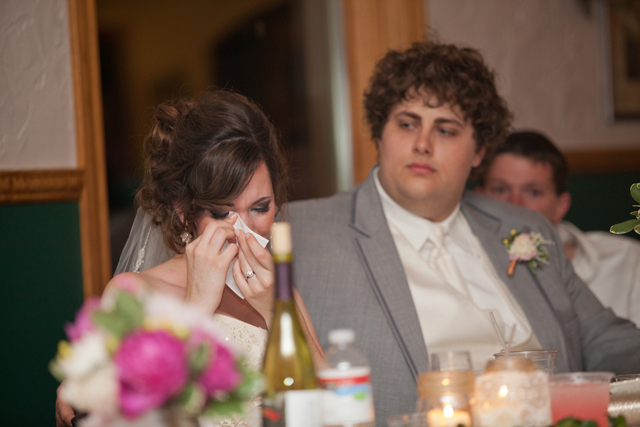 My sister, Blair, and Drew’s brother, Wes, both gave speeches that made us laugh and cry. 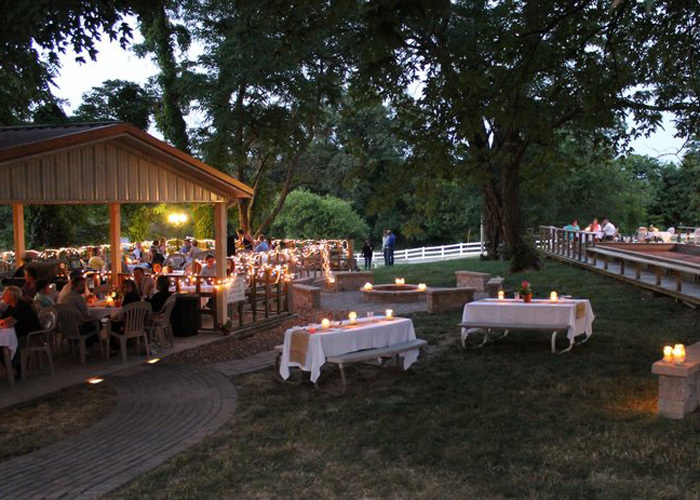 The evening was gorgeous with our DIY candle luminaries lighting up the outside and the music and dancing were so much fun (we had a violinist play at the ceremony but a DJ for the rest of the evening). The whole day went by so fast and Drew and I drove off from the wedding late that evening with a car packed to the brim full of presents with “Just Married” written across the back and cans tied to the back of the car (which we promptly stopped down the road and cut off because they were so loud). We spent the entire hour drive to our bed and breakfast replaying over the day and excitedly chatting about how well everything went. -Breakfast that morning with Drew and chatting about our excitement for the day. I wish this moment had been a little longer, but it was nice to have a sweet, quiet moment to reflect on the day and the meaning of it together before all the busy, craziness of the day set in. 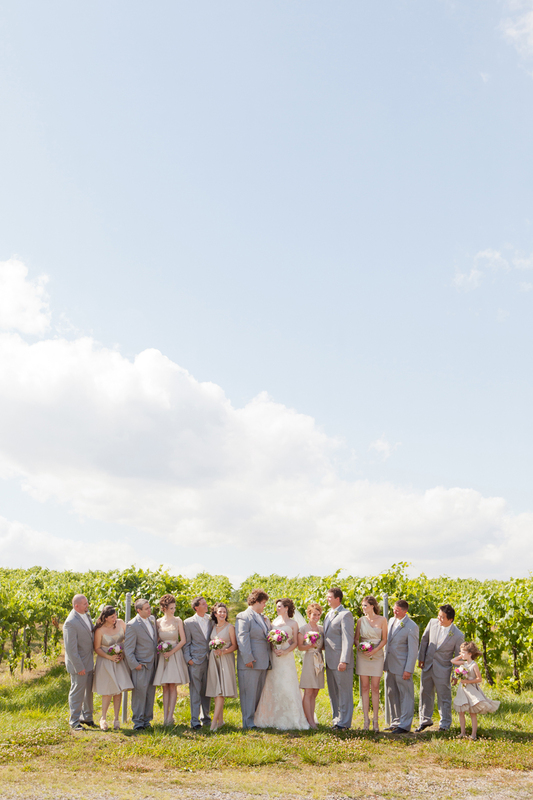 -The unbelievably awesome weather and our awesome venue with such pretty views. -Decorating and finally seeing all the elements I’d worked so hard on come together. 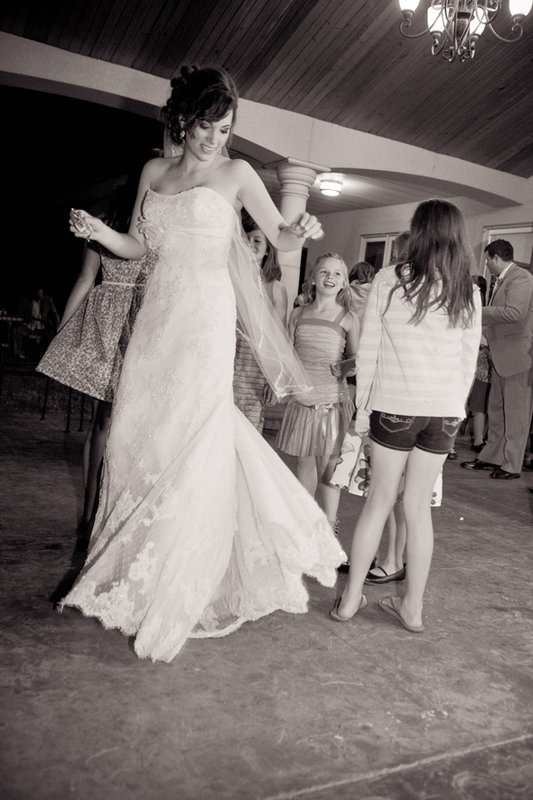 -Seeing everyone smiling, laughing, dancing and having a great time. 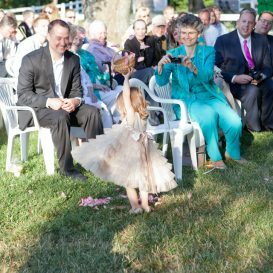 -Stories of my niece, Gigi, the flower girl, walking down the aisle and dumping all her petals in a pile at the end (I didn’t see since I was inside waiting to walk out). 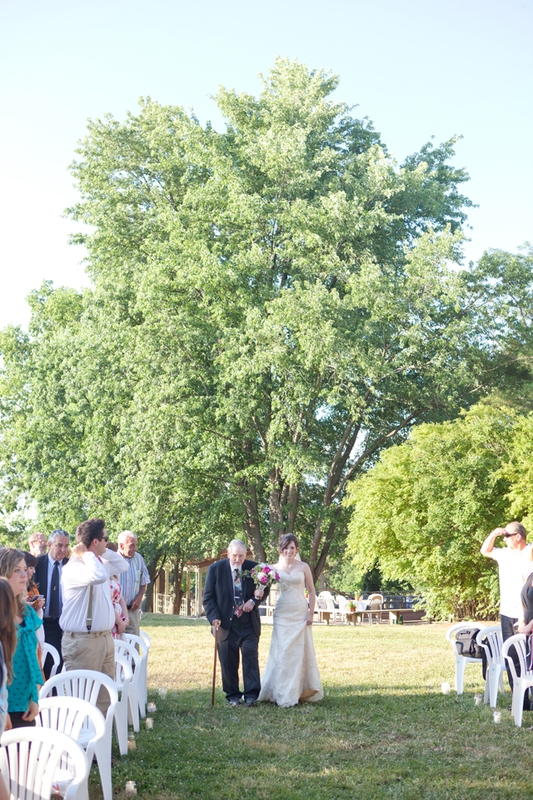 -Walking down the aisle with my grandpa. 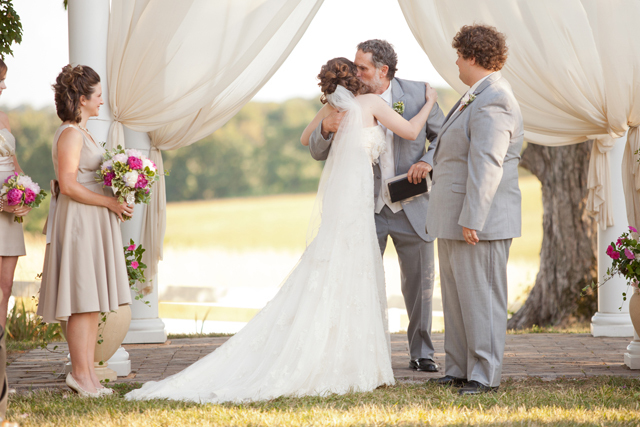 -Having my dad officiate the ceremony and dancing with him afterwards to Adele singing Bob Dylan’s “Make You Feel My Love” (the song was a little surprise I had for him and he teared up). -Spending the day with all my favorite people. 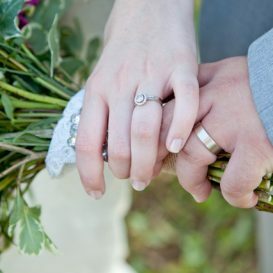 -Sweet little meaningful and DIY wedding details. 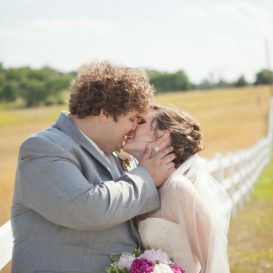 -Finally being married to my awesome husband and our utter excitement at the day having gone so wonderfully! 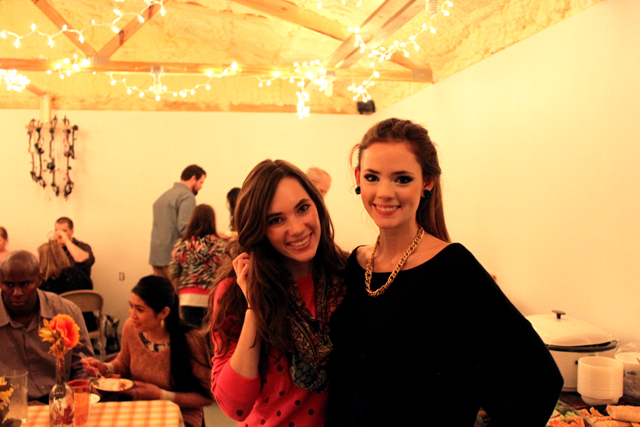 I hope you all had a lovely Thanksgiving! 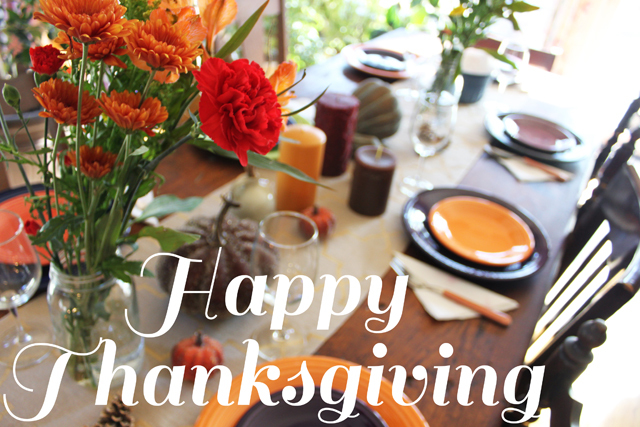 I really love Thanksgiving and think it is such a needed holiday. Everyone needs to be reminded of all they have to be thankful for and I’m happy that Thanksgiving gives us a chance to focus on our blessings from God. 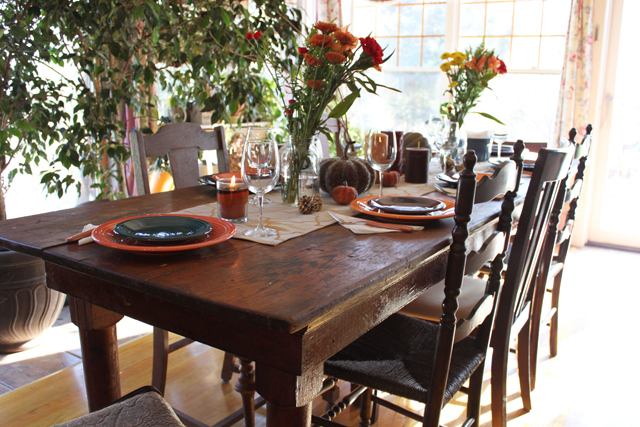 Isn’t that table gorgeous? I love it! My dad just put it into the kitchen of my childhood home and it is over 100 years old! It is the old meeting table of our local Moose lodge that my great-grandpa Wallace was a part of. I love the imperfection and character of it. 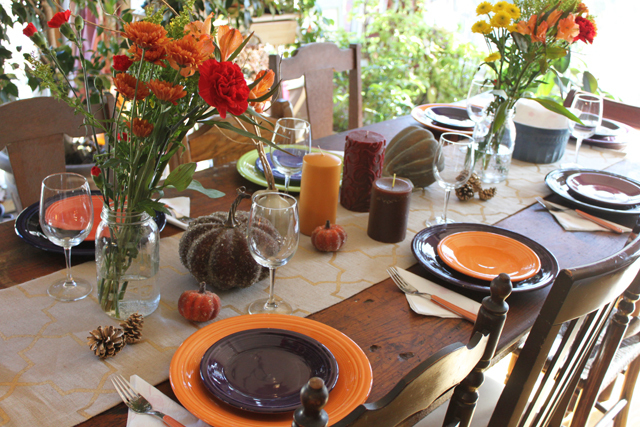 As I get older, it seems our Thanksgiving traditions seem to flux and change with different family needs. I really love tradition though, so I’m happy that it seems I’m still able to cherish traditions while also making way for new ones as well. 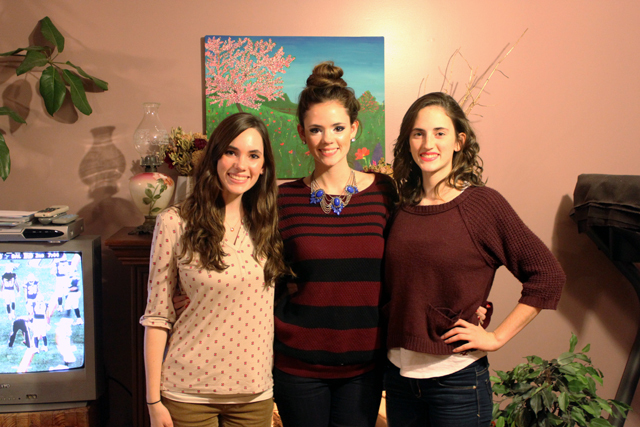 My younger sisters, my husband and I made Thanksgiving for our family. 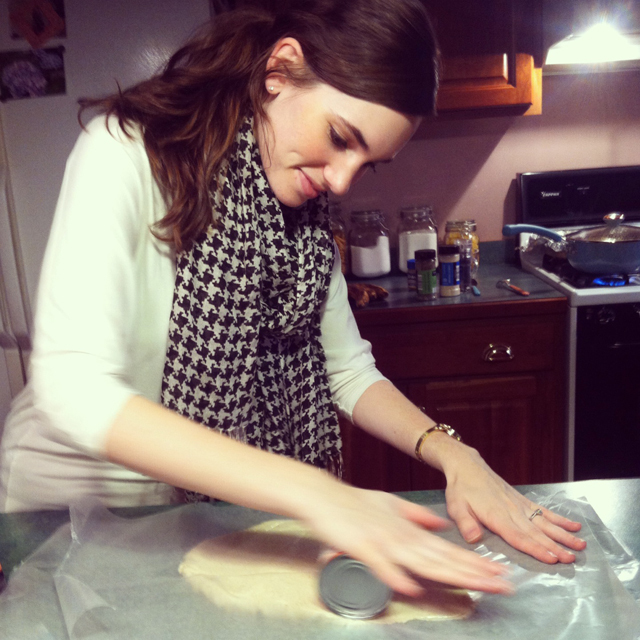 I love cooking and we had a great time getting everything together. 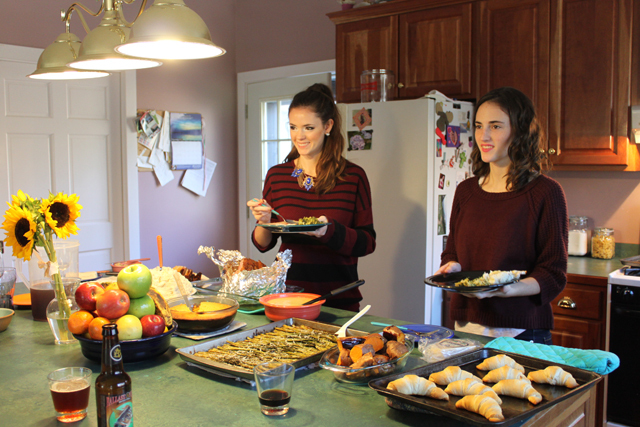 We made most of the traditional Thanksgiving foods, but the majority of everything we made was gluten-free. 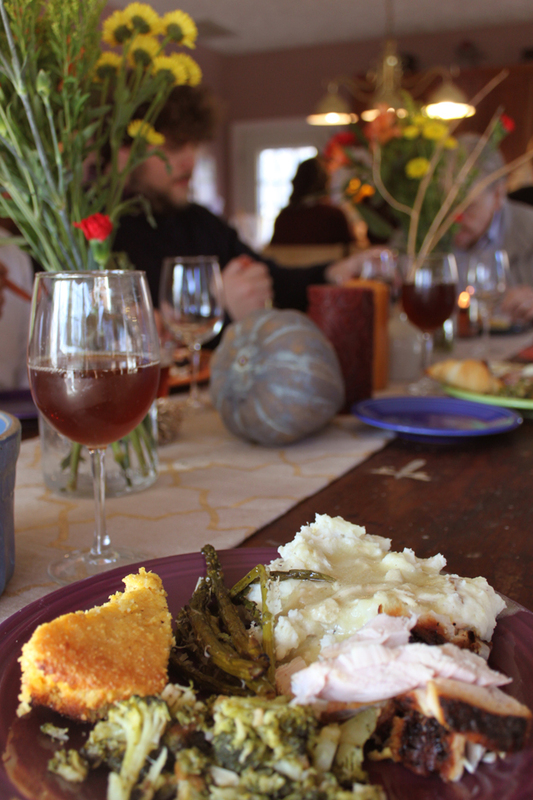 Mashed potatoes, homemade turkey gravy, baked sweet potatoes, roasted asparagus with Parmesan cheese, caramelized broccoli with garlic, GF cornbread, baked ham, deep fried turkey, sweet tea, and my Mamaw’s apple salad. 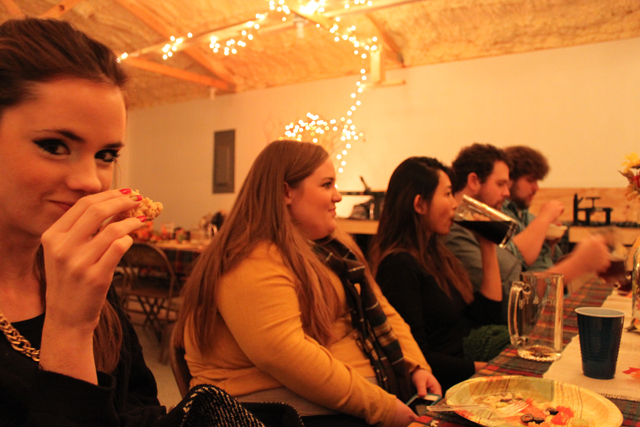 Kelsey and Jill also made crescent rolls, apple dumplings, and pies that weren’t gluten-free. I was traveling there the day before or else I would have made GF pies (I just didn’t eat any, I ate apple salad for dessert instead). 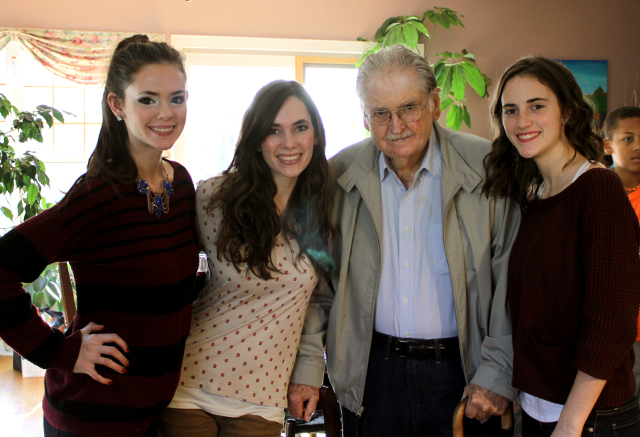 My younger sisters and I with my grandpa (above) and my dad (below). 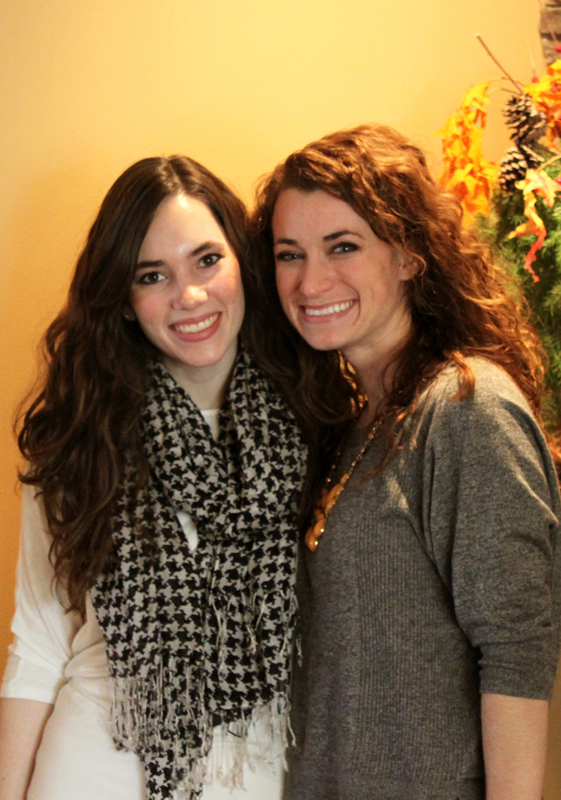 It was also nice to get to visit and chat with one of my best friends, Tonya, and her mom while I was in town. I also made a leftover turkey pot-pie complete with a homemade GF pie crust, rolled out with a can of tomatoes. 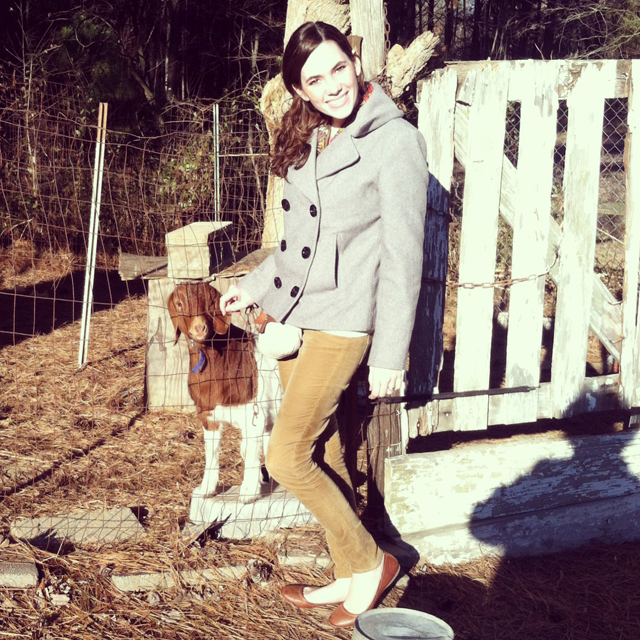 I also got to visit Fergus, my little sister, Jill’s, goat, who has packed on a little winter weight since I saw him this summer. 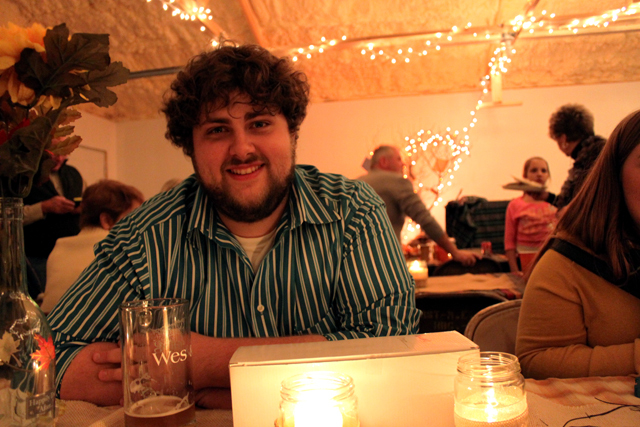 That weekend we also had a wedding celebration to help out with and attend for Drew’s brother, Wes, and his wife, Trang. Drew made (and hauled all the way from New Orleans) two different home-brewed beers and a homemade Root Beer. 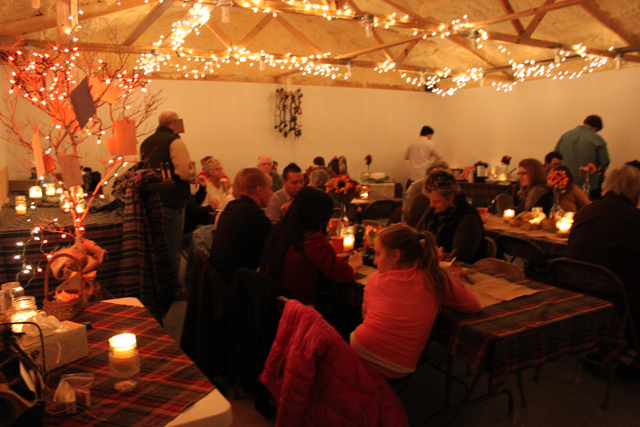 It was a lovely and fun evening with friends and family under glowing twinkly lights. Since we live in New Orleans, ten hours away from the rest of our families, it is always such cherished time when we are back in our familiar hometown, back in the country where you can see all the stars at night. 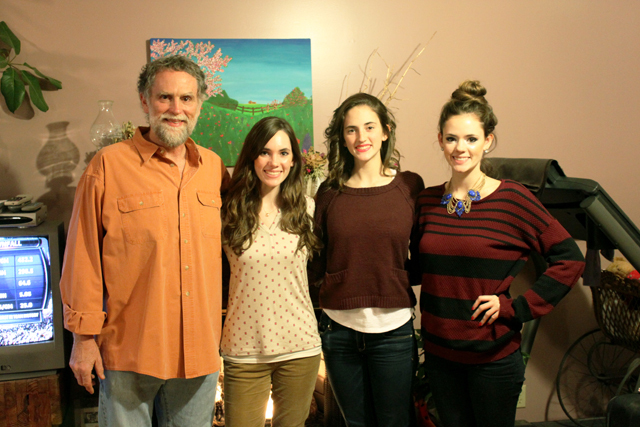 I’m so thankful for my family and I’m so happy I got to spend much-needed time with them. I only wish it was longer! Christmas will be here soon though! 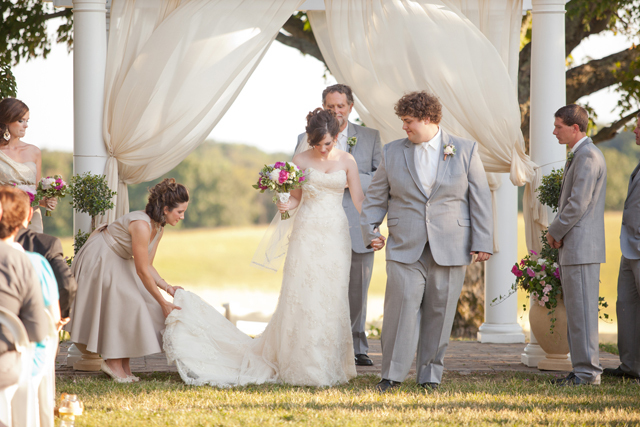 I love weddings and this one will always be special to me. 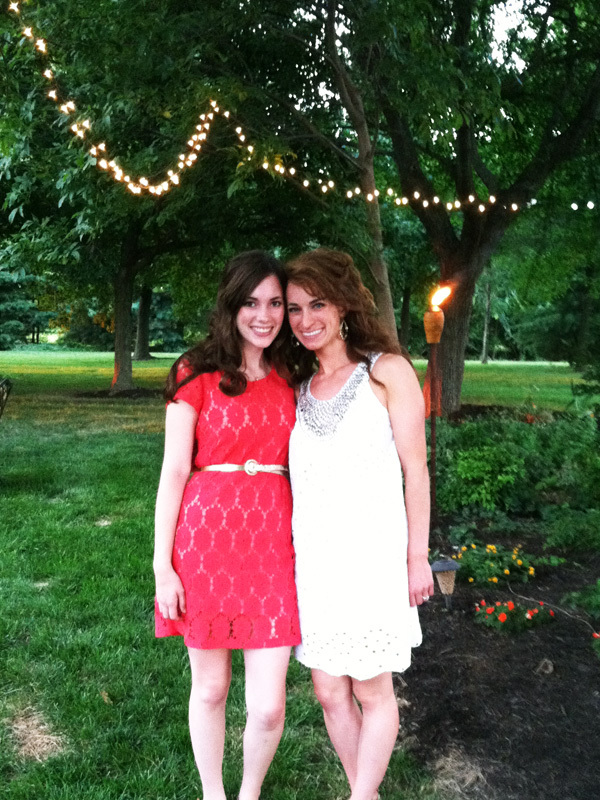 Tonya helped me implement a lot of the details for my own wedding last summer and I did the same for her this summer. 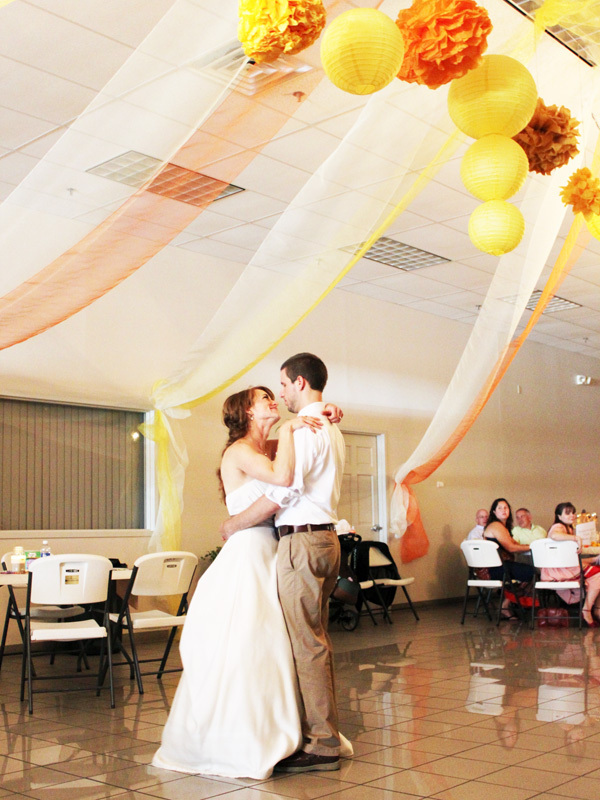 Helping her plan and decorate and everything was kind-of like re-living my own wedding over again! It was so much fun. 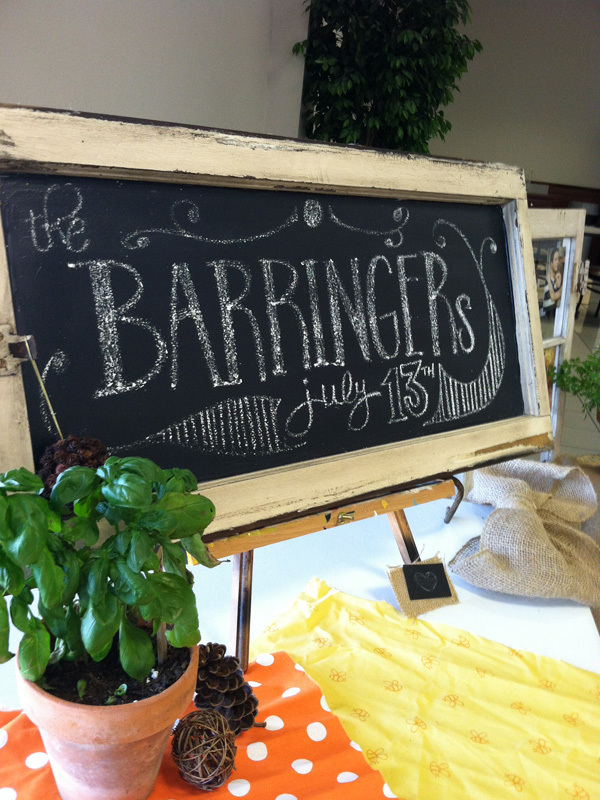 Tonya is super creative and put together lots of super fun details into the decor! Her brother cut all the stumps and tree slices for her and her and her mom painted them with sayings and chalkboard paint for signs. 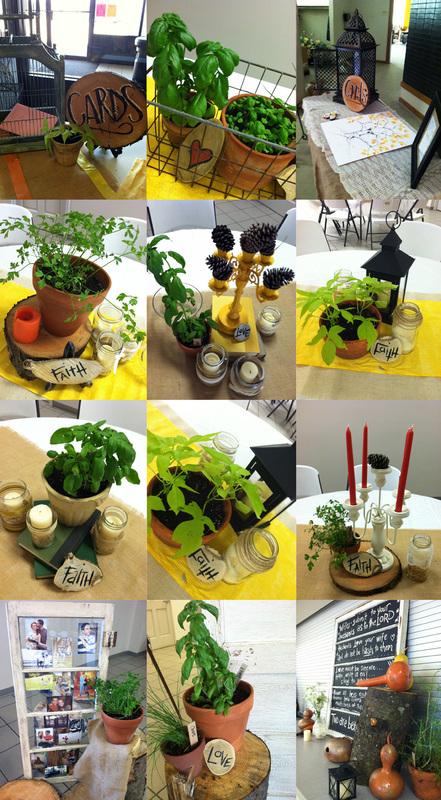 Her mom also grew all the fresh herbs in little pots and also grew sunflowers that were scattered around as well. 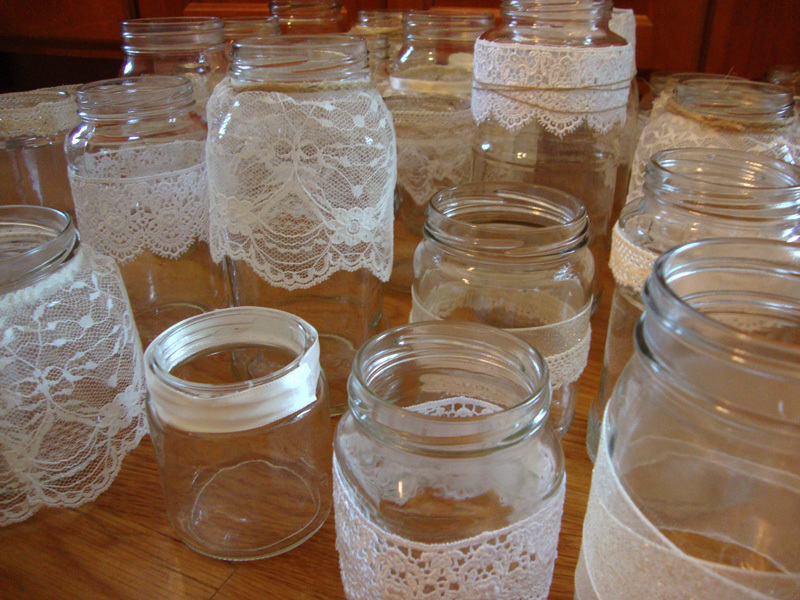 The tables were all decorated differently with a combination of old books, glass jars (leftover from my wedding!) that instead of filling with sand and then candles, she filled with wheat berries and soybeans (her family farms) and candles, thrifted candelabras (spray painted in her colors) and a collection of other lamps and birdcages. They had several old doors and old windows that they re-purposed into backdrops and message boards. This old window turned chalkboard message board was one of my favorites. Tonya has great handwriting. 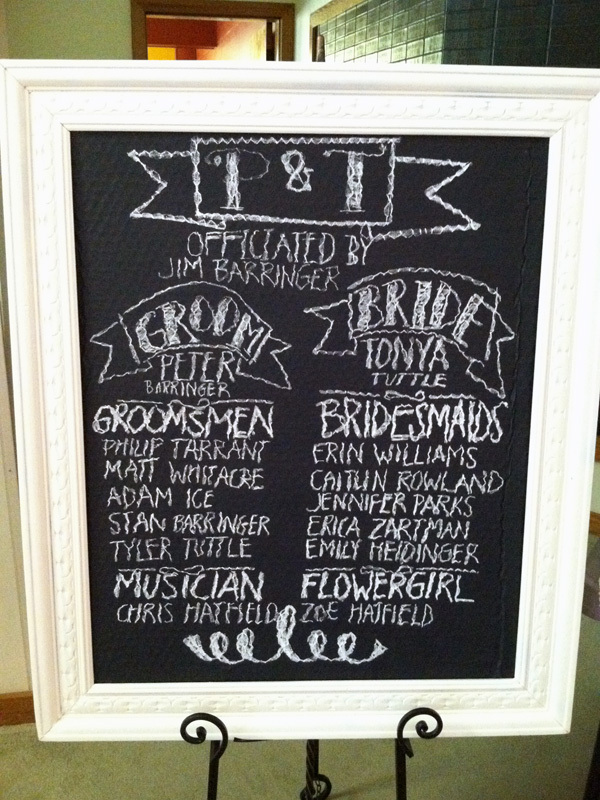 I also loved this old frame turned chalkboard wedding program. 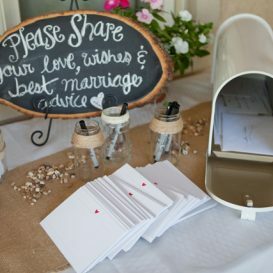 Such a great idea to let guests know who is meaningful to your special day without spending the extra money to print out programs for every guest. 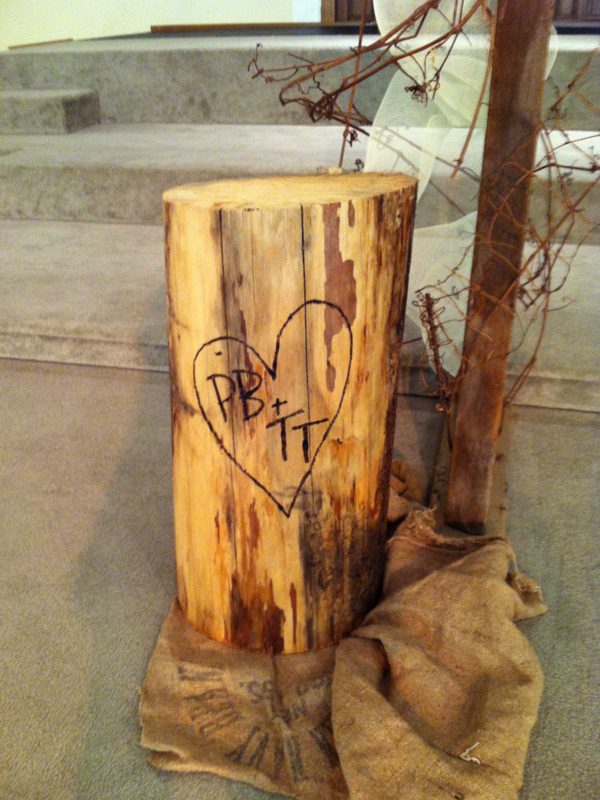 Another of my favorite little details was this tree stump (Tonya’s brother cut for her) that she stripped and woodburned her and Peter’s initials into. 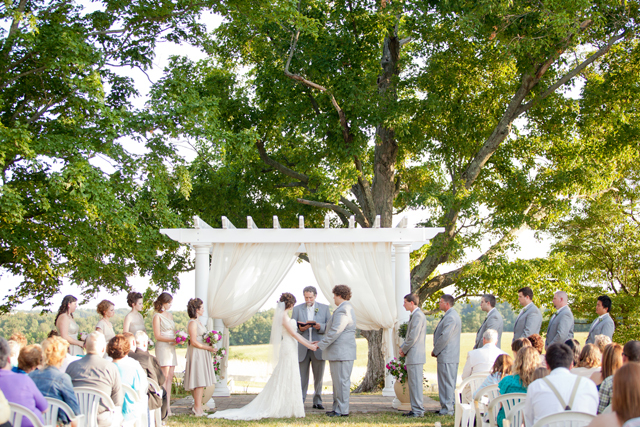 It was right next to the old ladder turned arbor that she got married under. 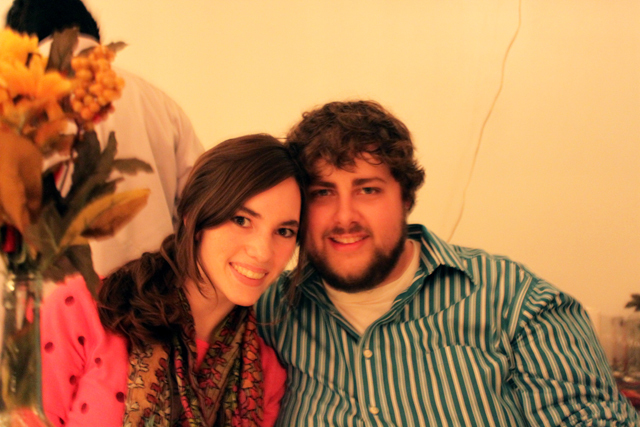 This picture was taken as we were decorating, but for the wedding, there were also plants surrounding it as well. I love this! I think it would be such a cute side table in her house now! 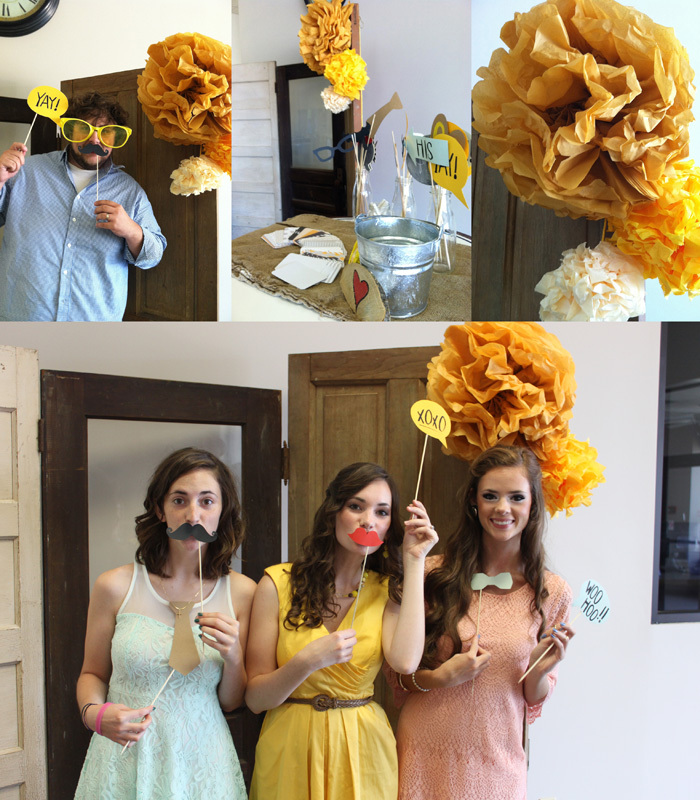 This photobooth was the best! The guests loved it! The backdrop Tonya made from old doors, she made the tissue paper pom poms herself, as well as all the cute little props! 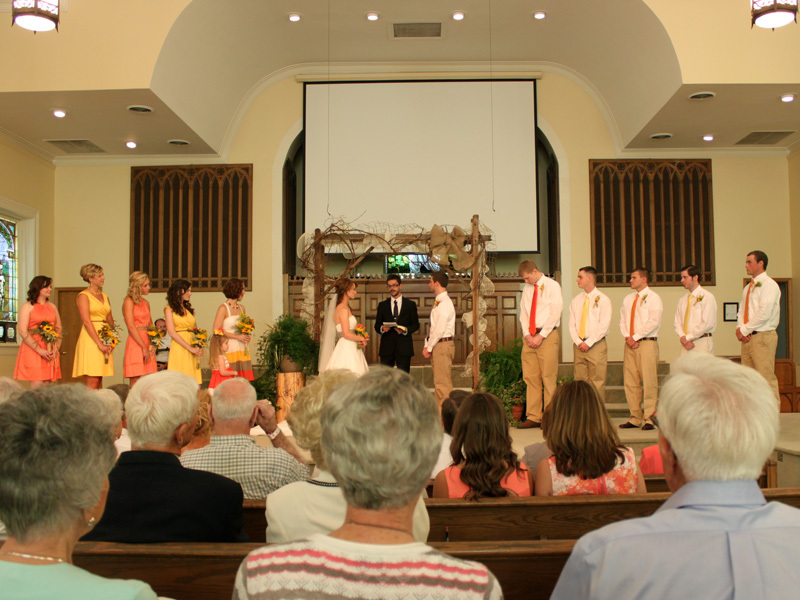 Here you can see the dresses, flowers, arbor and church setting. 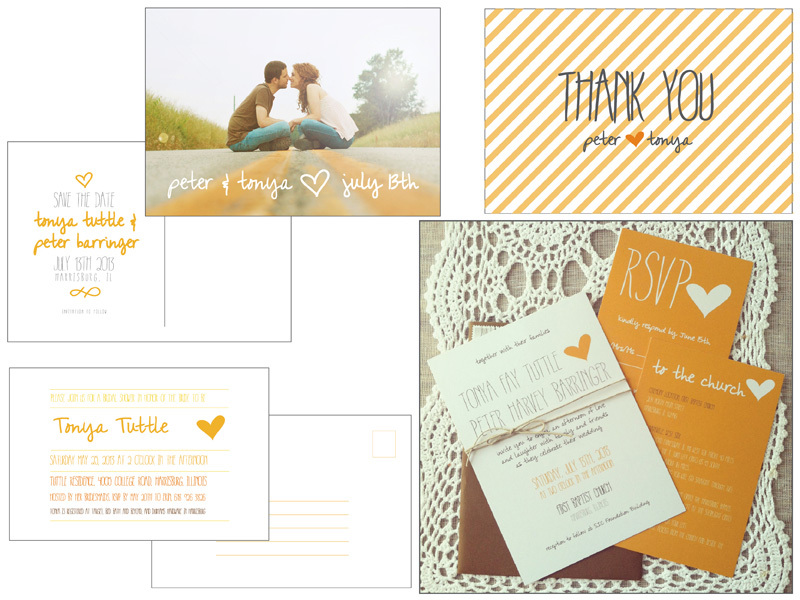 Some of my favorite designs to date! 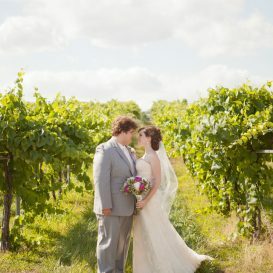 Congratulations to Tonya and Peter! 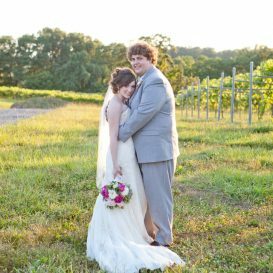 Our first anniversary was on June 2nd! 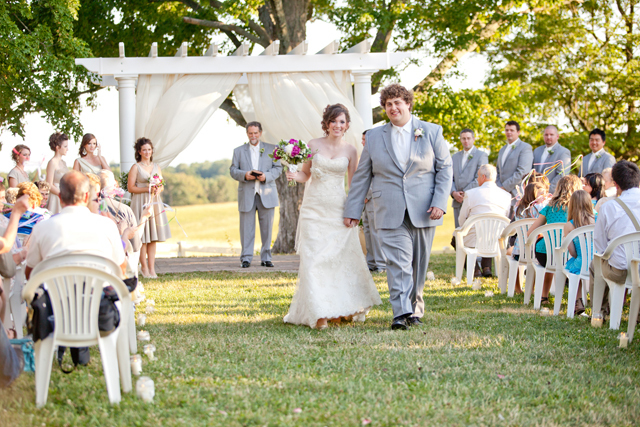 Can you believe that Drew and I have already been married for over a year!? Ahh, so crazy! I was planning to do an anniversary post over here that day, but I was off to Puerto Rico with my family (more on that later). 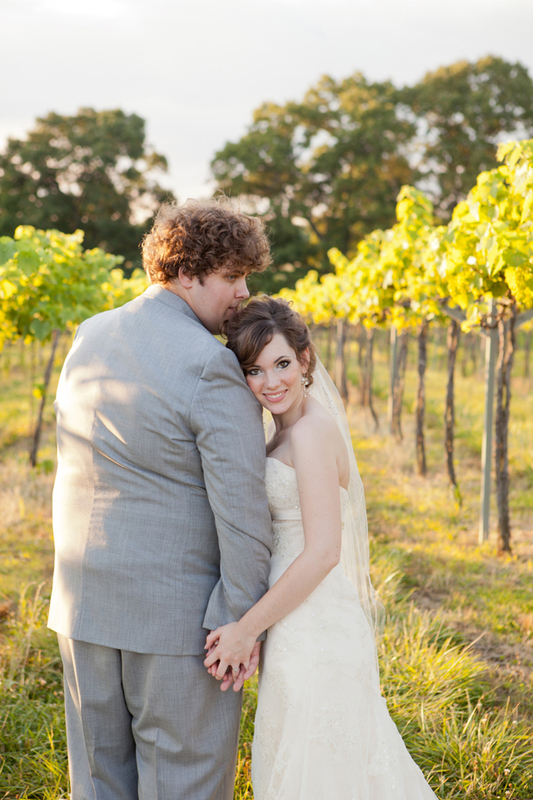 I still haven’t finished up my series of wedding posts I started last summer, but I’ll finish those eventually. 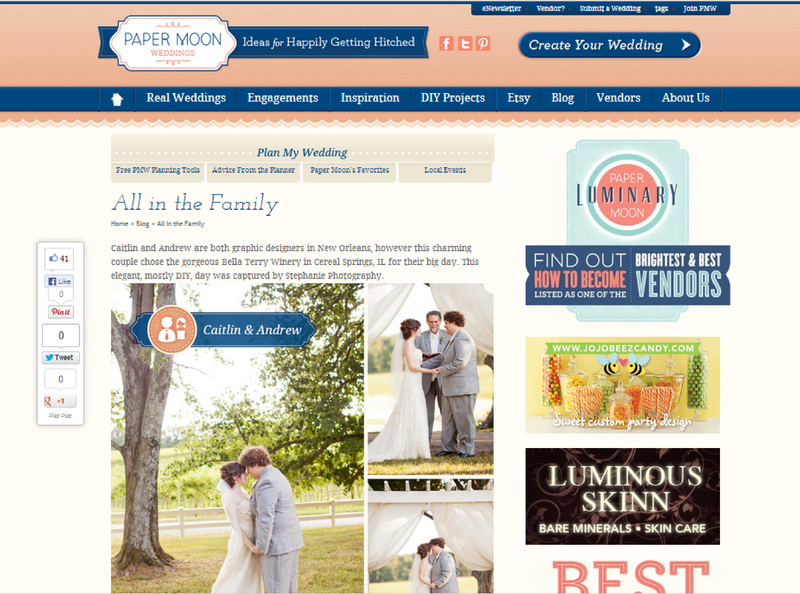 Today, I’m excited to announce that our wedding is being featured on the wedding blog, Paper Moon Weddings. 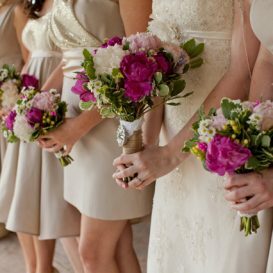 So we’ve covered the flowers and the bridal gown & accessories, now let’s move on to the bridesmaids and groomsmen’s attire! 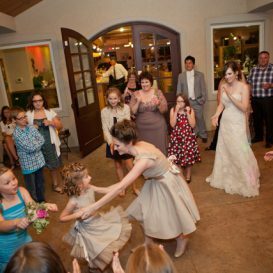 The bridesmaid’s dresses were made by my mom. 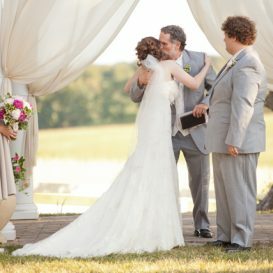 It really was the only way to go for me, because my older sister was pregnant and had her baby just a couple months before the wedding (so it would have been impossible to guess her size beforehand on any store bought dress) and my seven-year-old niece, Evie, was one of the bridesmaids (it would have been equally impossible to find a dress for her that matched any older girl dress styles in any store). 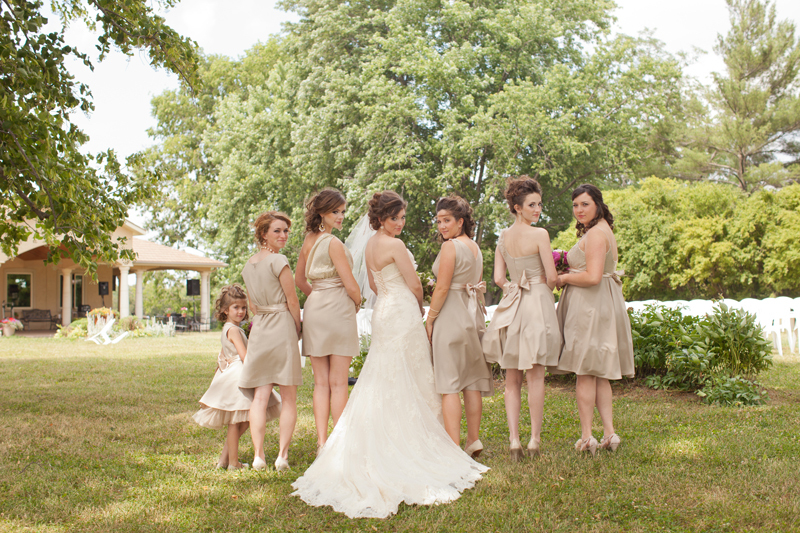 Along the way, we had a few disagreements amongst us all about what the dresses should look like/be made out of, but in the end I think they turned out great. 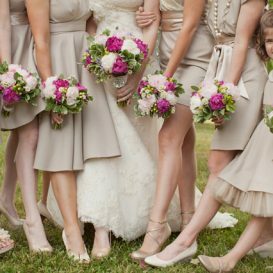 I knew all along that I wanted to go with a neutral color for the bridesmaids dresses (I think brightly colored bridesmaids dresses can be distracting and take attention away from the attire of the bride), but also because I love the way they look simple, sophisticated and classy. I wanted the flowers to be the pop of color. I picked out a light champagne colored linen (it was a linen blend, to help reduce the amount of wrinkling — I liked the feel and texture of the fabric and felt it was much more flattering than a shiny taffeta-like fabric that most bridal stores sell bridesmaids dresses made out of) and we accented the dresses with champagne colored satin, tulle, and sequined fabric. 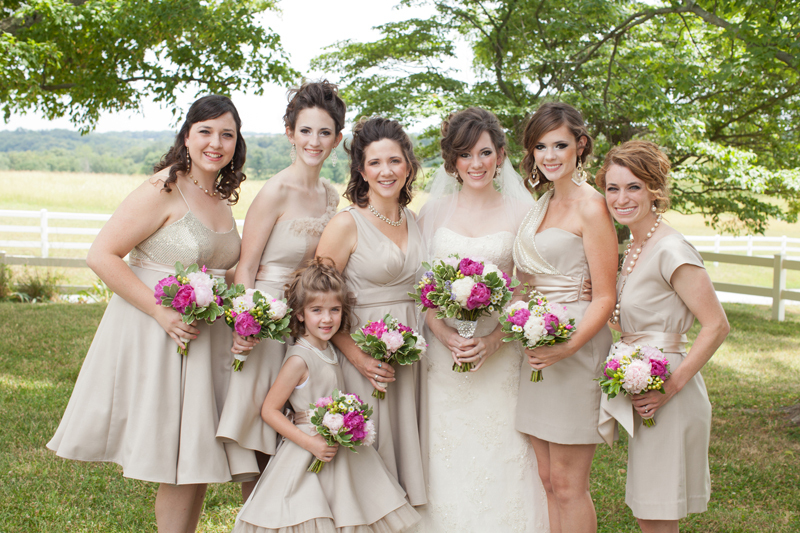 I love the way the several different fabrics were incorporated differently into each dress. I decided to go for a similar-but-different dress style and allow each girl to design the style of her dress. 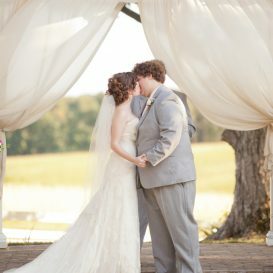 I’m happy that I was able to go this route and allow all my bridesmaids to pick something to wear that they were comfortable in. 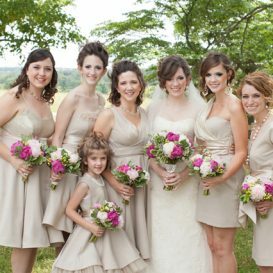 I was told by several people that they “could really see the personalities of each of the bridesmaids in their dresses”. 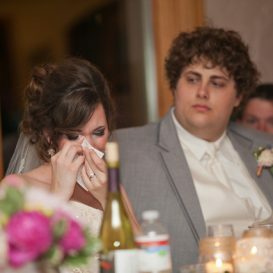 The top of my older sister’s dress was even made to allow her to easily nurse baby Jackson. I had each girl pick her own shoes as well. My only stipulation was that they be either gold, champagne, or cream colored and be some kind of heel, fancy sandal, or ballet flat. My two younger sisters and my nieces even found gold/champagne glittery shoes similar to mine. 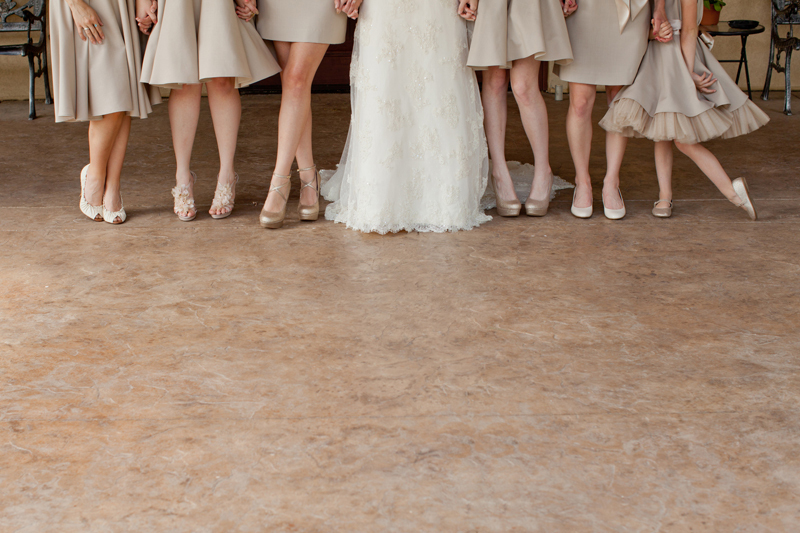 My older sister’s cream colored shoes (the third from the left) are the same shoes she wore for her own wedding day. 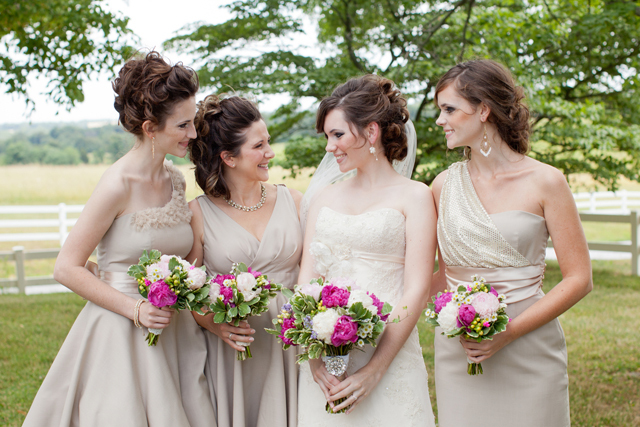 I told each bridesmaid to choose her own jewelry as well, just to keep it classy and neutral (gold, silver, rhinestones or pearls — no bright colors) and choose whatever she thought would go well with the style of her dress. All nails were painted either a neutral color or any shade of pink. I also told them to each do their hair however they liked. I think they all did a fabulous job with hair, shoes, and accessories! I do really think that the personality of each of these wonderful ladies shone through their attire. Their dresses, shoes, accessories, hair, etc really did highlight each of them well. They picked things that I imagined that they would. Look how sassy my niece, Evie, is! So funny! I love all these pictures. 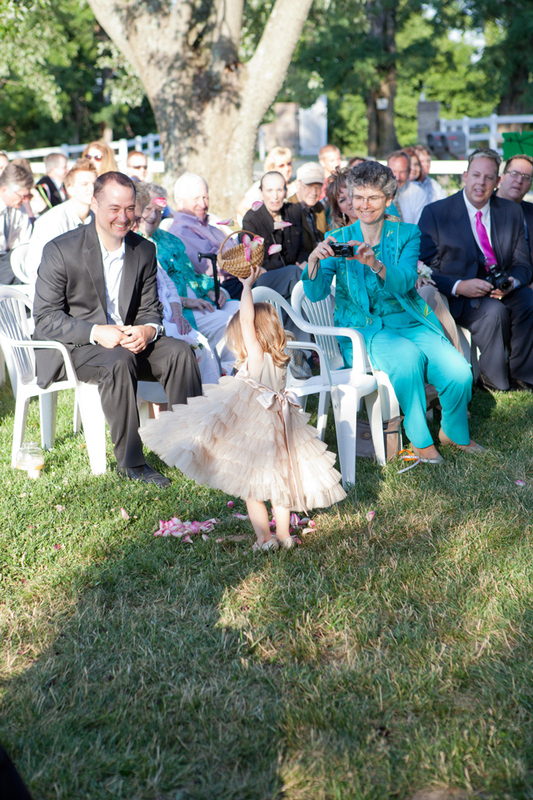 The littlest lady of the wedding day was my lovely two-year-old niece, Georgiana, the flower girl. Isn’t she adorable? 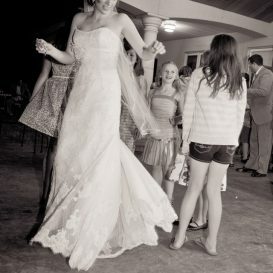 My mom made her dress as well, out of the same materials as the big girls’ dresses. My mom actually made that basket too (sewing and basket-weaving are two of her many talents), and both the basket and the flower in her hair are the same ones that Evie used several years ago when she was a flower girl in her parent’s wedding. 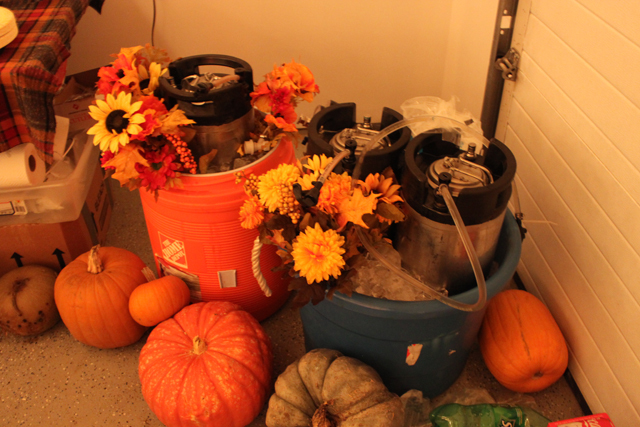 I love that we incorporated those same things into my wedding. Now on to the boys! First, to introduce them. From left to right — (in the photo above) my older brother, Blake, Drew’s older brother, Doug, Drew’s childhood friend, Ryan, then Drew of course, then Drew’s oldest brother, Robbie, Drew’s older brother, Wes, then Drew’s work friend, Yutaka. 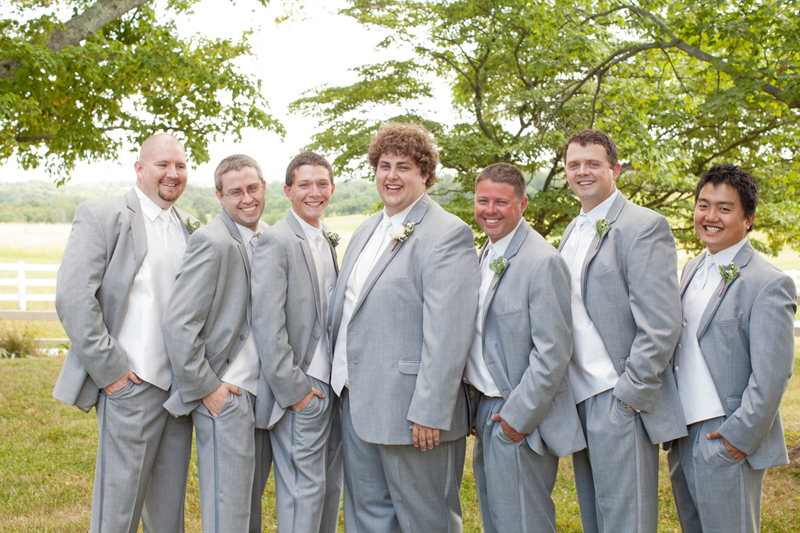 We went with grey tuxes for all the guys (black seemed too harsh a color for a country, outdoor wedding) with an ivory/cream color tie and vest. 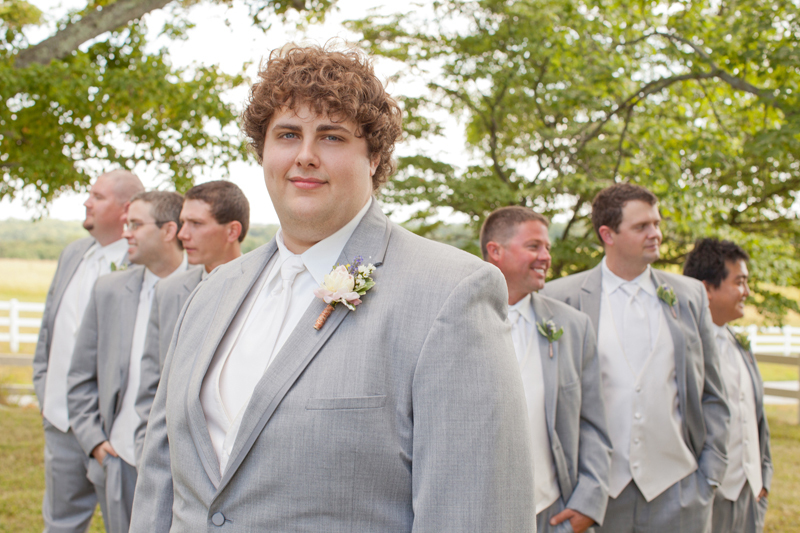 I actually originally planned to have only Drew in the cream color and I picked out a champagne colored vest and tie for the groomsmen to tie better into the bridesmaids dresses, but I ended up changing it a month or so before the wedding. 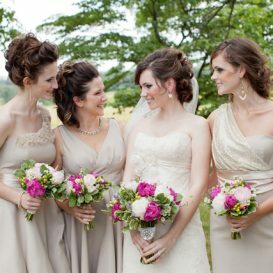 The bridesmaids dresses weren’t done yet, and I was worried the champagne color wasn’t going to be the right color. I wish I had stuck with it, I think it would have looked better overall, but it’s not that big of a deal. I love these silly shots of them! 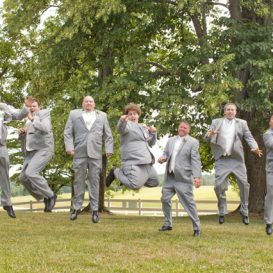 In the one below, they are all freaking out over Drew’s wedding ring, except that we took pictures before the ceremony and I forgot to give him the ring to wear for the picture! Oh well, it is still funny! 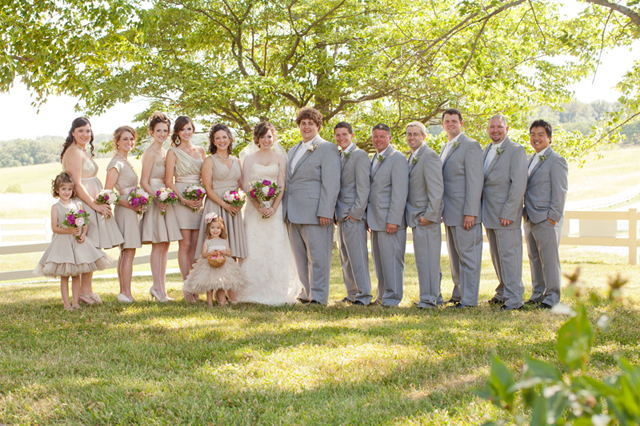 All pictures taken by the wonderful Stephanie Milligan of Stephanie’s Photography. 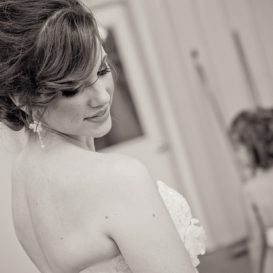 I highly recommend her if you are in need of a wonderful photographer! Check out her website, here. 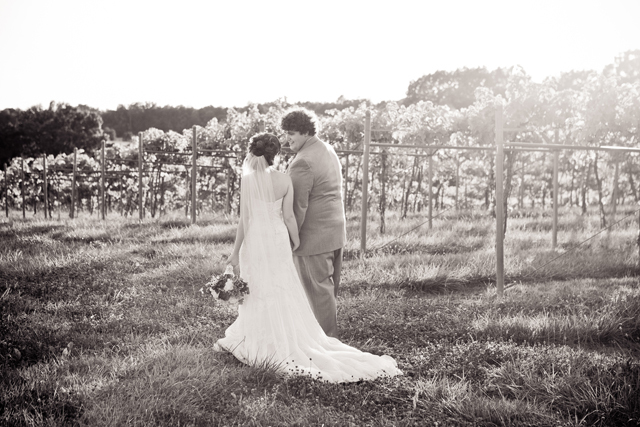 To read about our wedding flowers, check out this post. 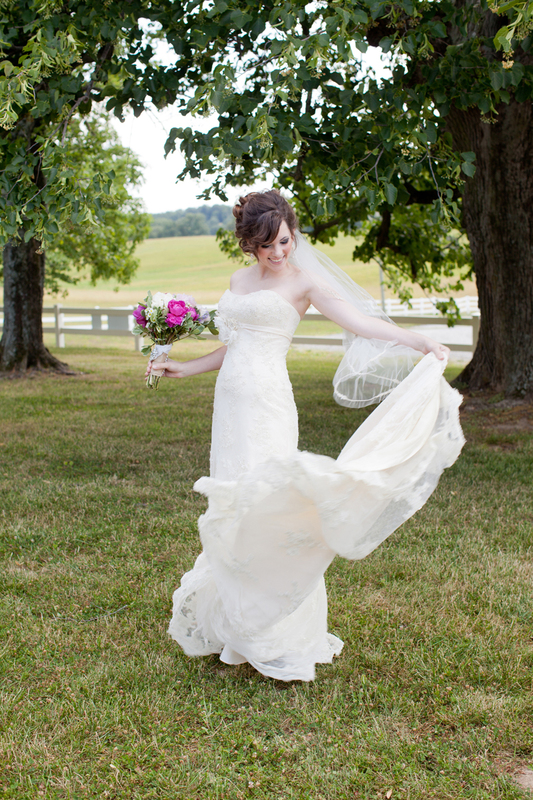 To read about my bridal attire, check out this post. 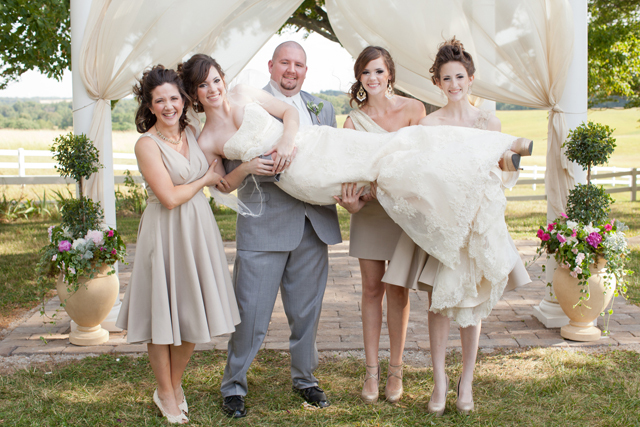 One of the most important things surrounding a wedding day (for the bride) is the dress. 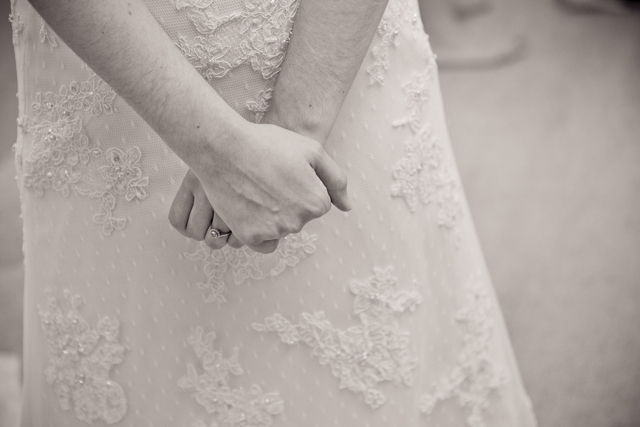 I had always known what type of dress I wanted — antique lace, fitted, slightly off-white, very elegant and classic. 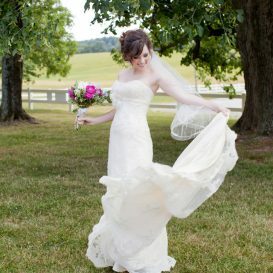 The very first day I went wedding dress shopping (with my older sister in her town just outside Nashville, TN) I found the one. I loved it, but tried on other dresses at other shops and then came back a month or two later with my mom, all my sisters and nieces in tow to try it on again and show them and then we bought it! It really is a nerve-wracking process! 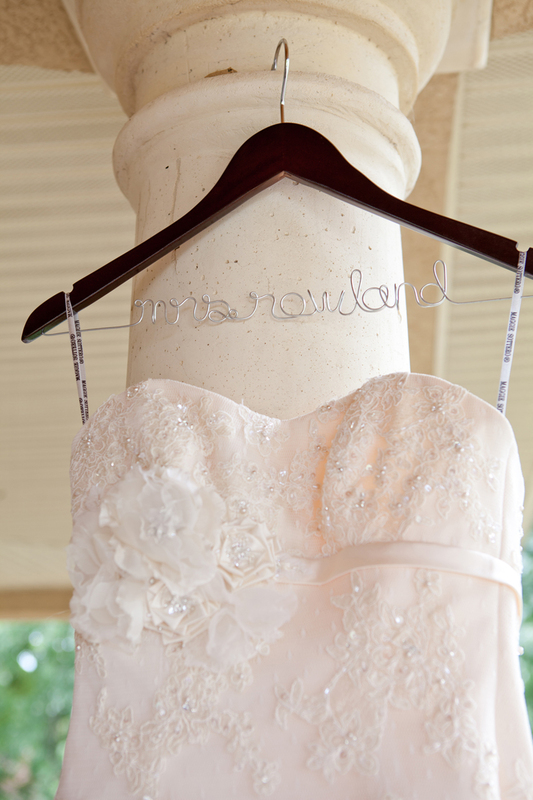 All the lovely gowns to choose from, the beautiful lace and fabrics, the details, it makes the choosing process hard! 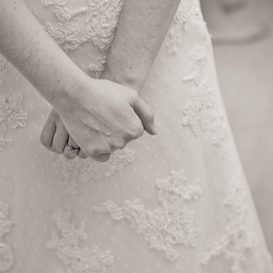 I originally thought I wanted something with small sleeves, but all the lace sleeves on dresses were so itchy on my skin! 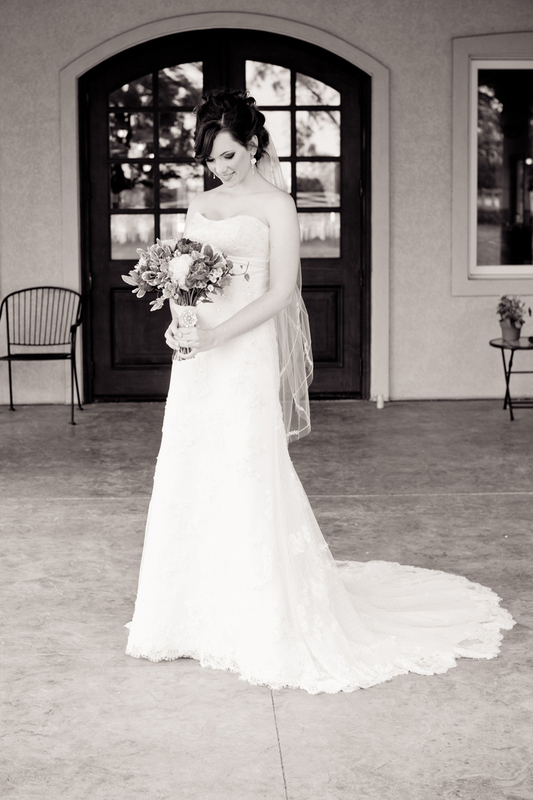 The prices on wedding dresses are unbelievable! Such expensive garments for one short day. Plus, after choosing a dress, then seeing other ones, you always start to second guess your decision. 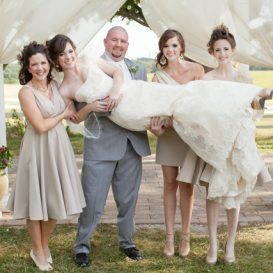 The designer of the dress is Maggie Sottero and the name is “Harlow.” It comes in several color options and mine is “Ivory & Champagne lace over Light Gold.” The official description of the gown is: “One-piece, strapless, slim A-line gown with corset closure. 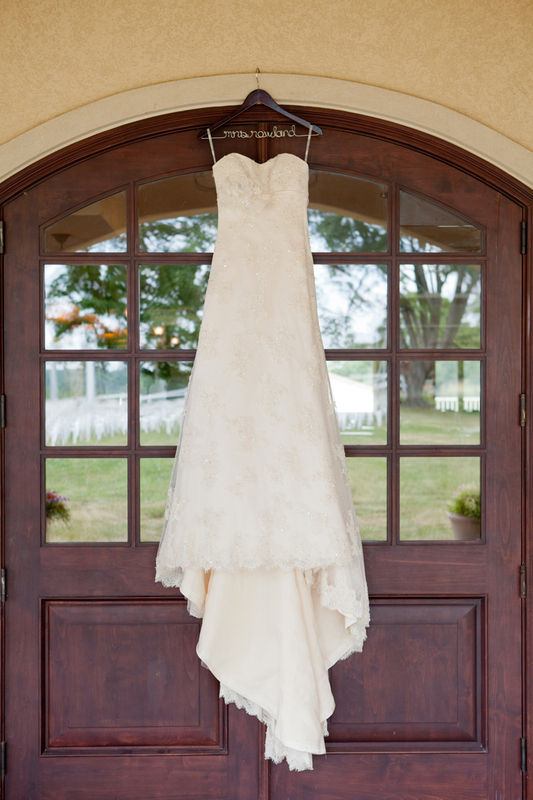 This gorgeous Chantilly Lace gown highlighted with beaded embellishments inspires true romance. 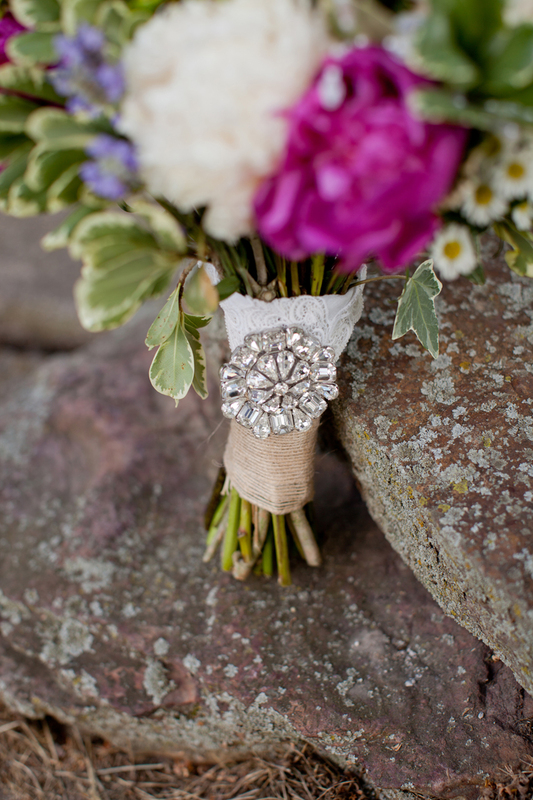 A satin band and handmade flower create a lovely empire accent.” You can view it online here. 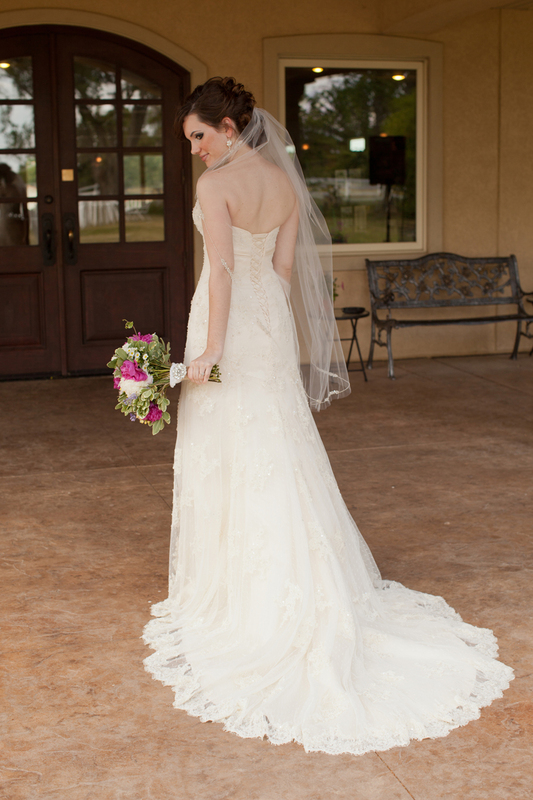 Even though my veil was expensive as well (for just a bit of tulle!) I think it complemented the dress so perfectly and I’m so happy I went with it. I think the length and beaded accent were just perfect. I’m sorry, but I don’t know the name of it. The dress shop that I went to simply tried different veils on me to see which I liked and I forgot to ask the name. I felt so gorgeous in this gown. 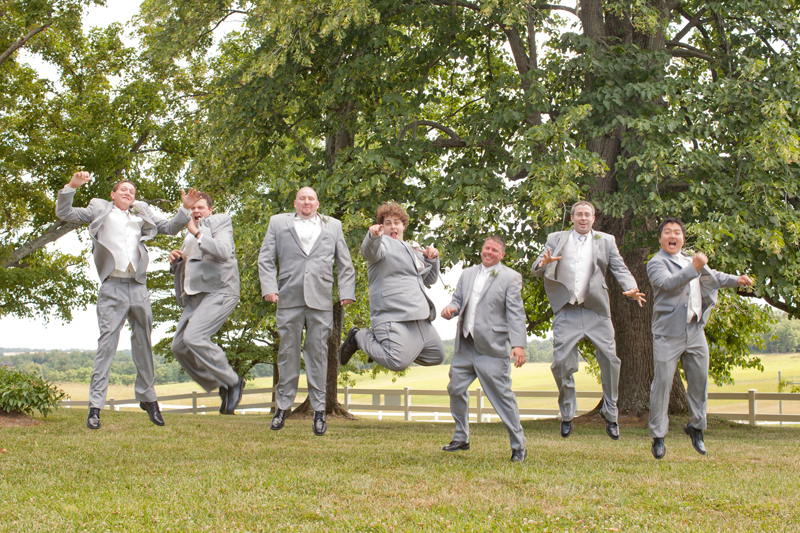 That is so key for a wedding day. Choose what you love and what makes you happy. 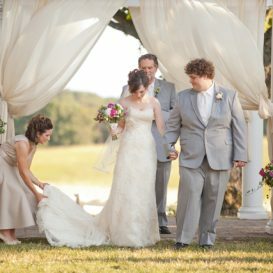 I was worried about the dress being too formal for an outdoor wedding, but I think it turned out lovely. 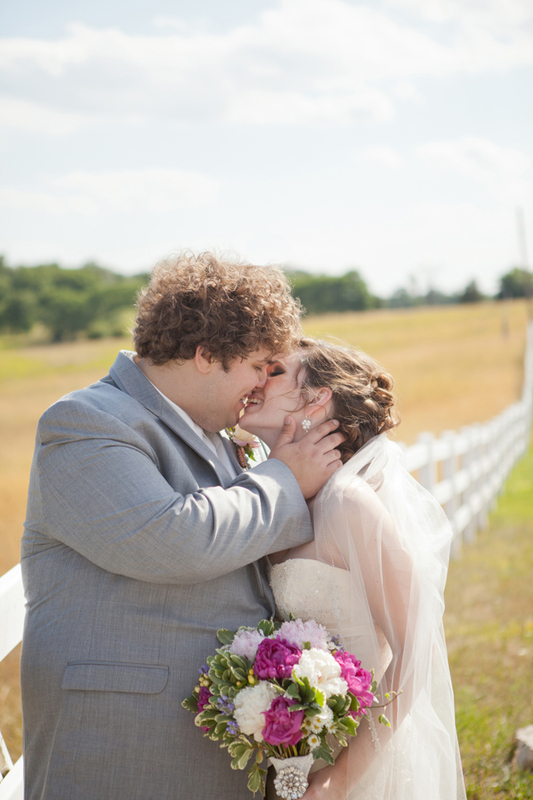 Our first kiss as husband and wife! Doesn’t the dress look lovely? 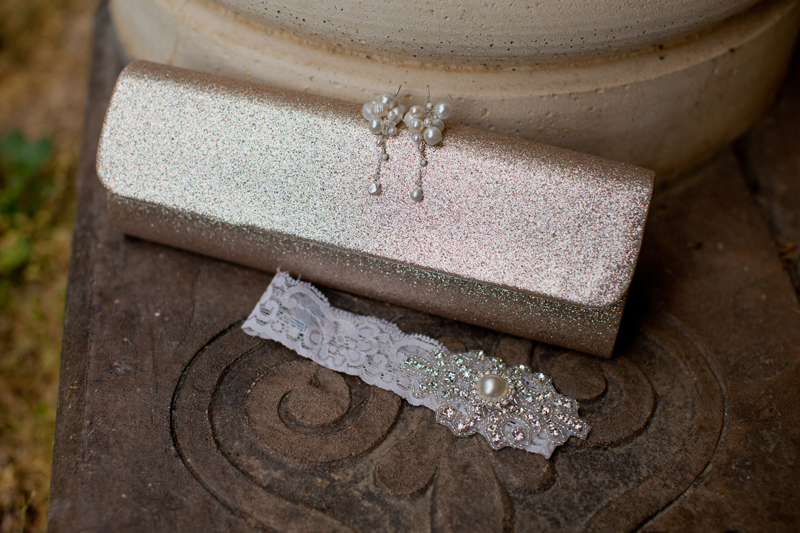 The other bridal accessories are important too. I choose to wear sparkly gold pumps. I bought these from the same bridal shop that I purchased my gown and veil from. The shop is called The White Room and you should definitely check it out if you are in the Nashville, TN area. Everyone there was so nice. 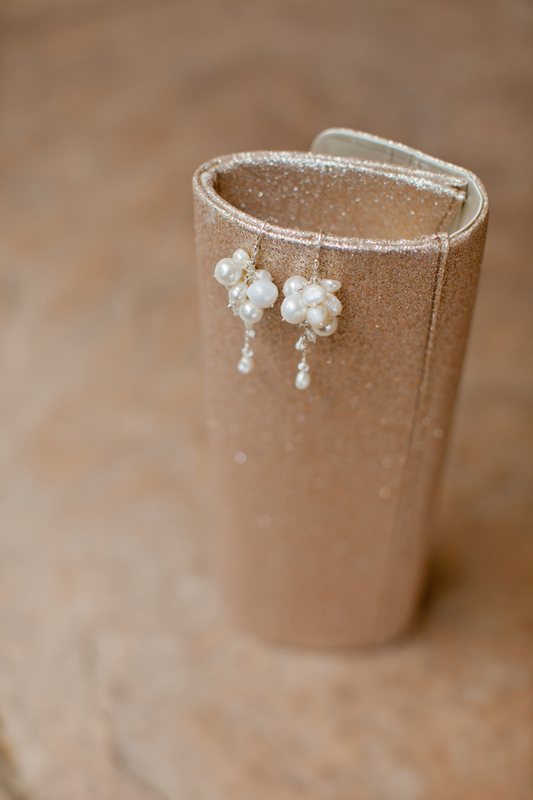 Sparkly champagne/gold clutch, perfect for holding my lip gloss and other necessities at the bridal table and my earrings. The clutch I actually found at Payless Shoe Source a few days before the wedding while I was there with my sister looking for shoes for my nieces. The earrings are actually one of the first things I bought for the wedding. I bought them way before I even found my dress. They can be found online here and are from Noon Design Shop in California. Drew’s brother’s girlfriend Trang gave me a coin pearl necklace from Noon a few years ago as a gift, so when we were in California, the winter we got engaged, we visited the shop and I bought this simple, pretty crystal necklace that I wear daily. (I have a gold and a silver version!). I love their jewelry designs. 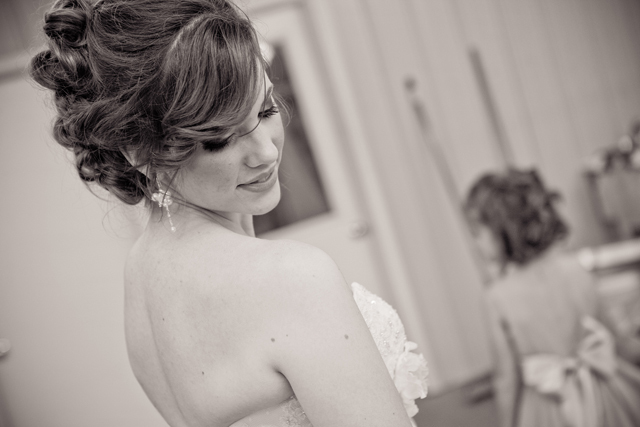 These pearl cluster earrings were perfect for my wedding. 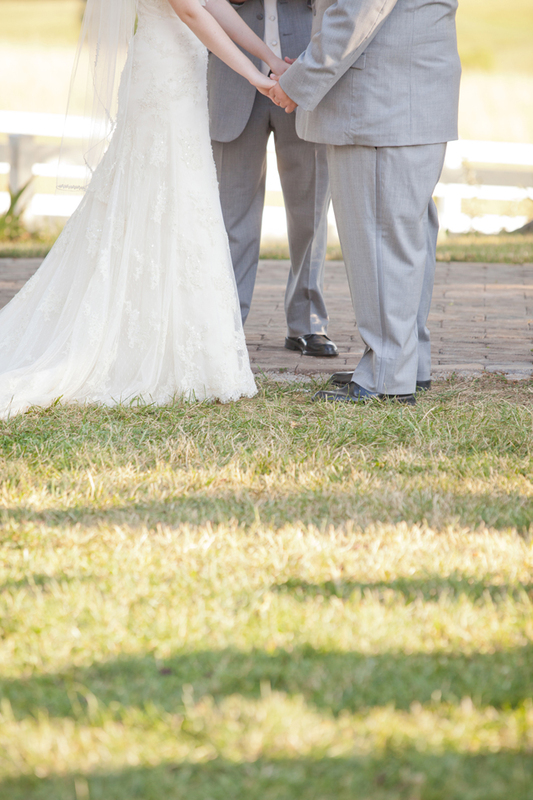 Earrings, clutch, garter — everything went together so well! 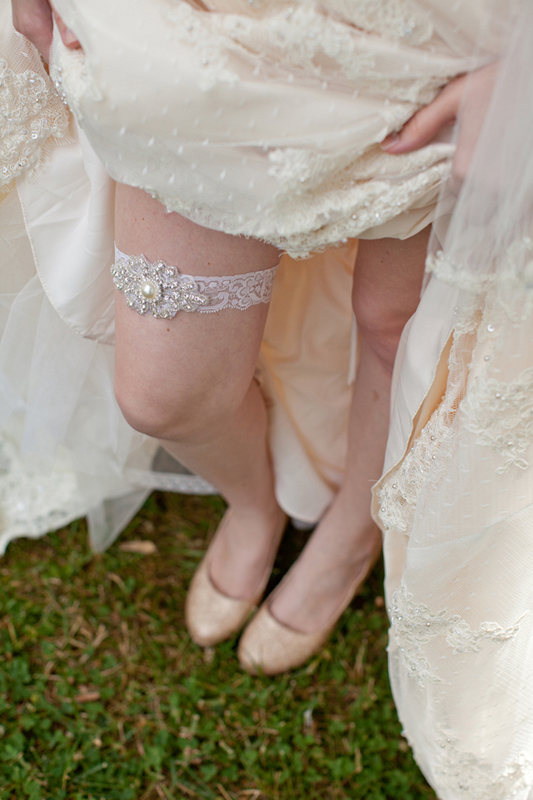 I really, really loved my garter. 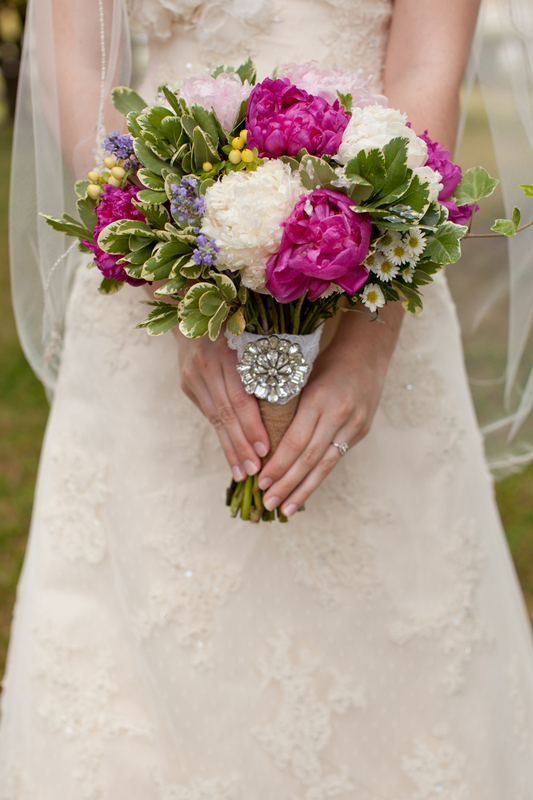 The lace, the sparkle, the pearl — it was all so gorgeous and went so well with my gown and other accessories. I bought it from this shop on Etsy. 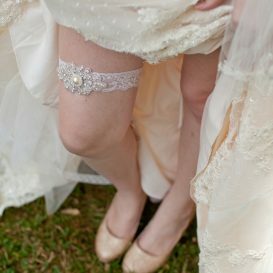 It also came with a beautiful tossing garter as well. This one looks really similar to mine. 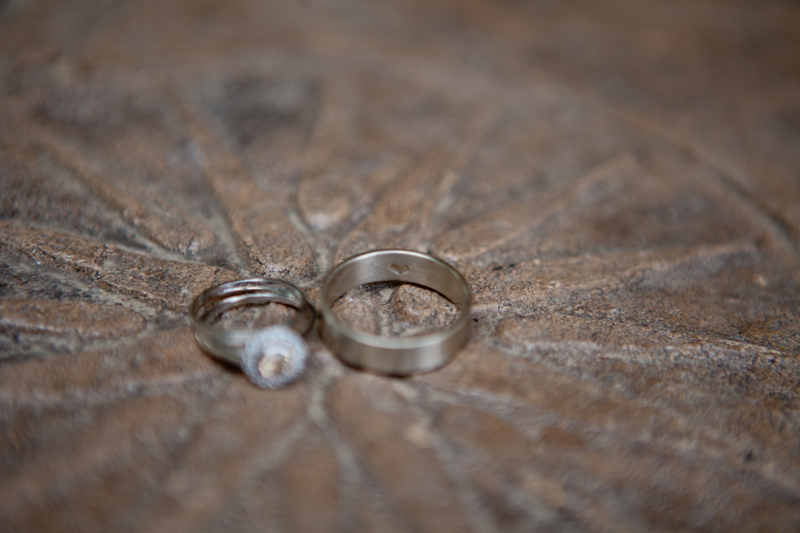 Last but not least — rings! 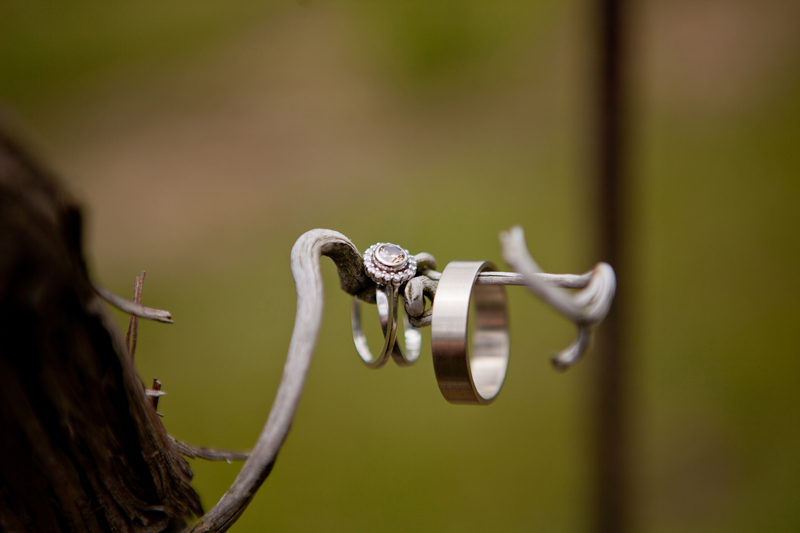 One of the most important accessories of the wedding day! You can read all about ours here. I’m so happy with them. I love my handmade champagne diamond engagement ring and I’m happy I had my promise ring redesigned to use as a wedding ring. I love that it is so sentimental. I also love Drew’s ring we had made by the lady that made my engagement ring and I just love the little heart detail I had her add inside it. 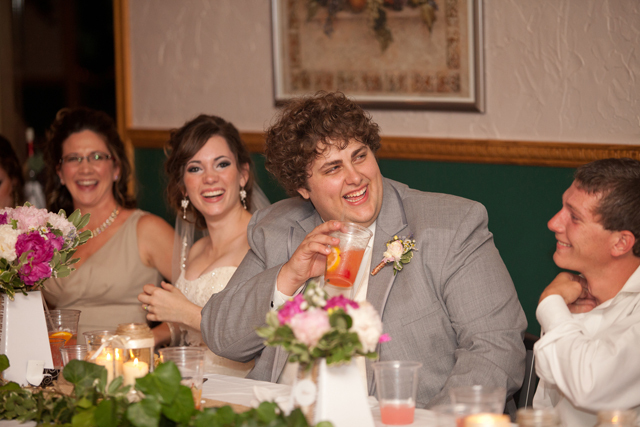 This last picture is one of my favorites from our wedding day. 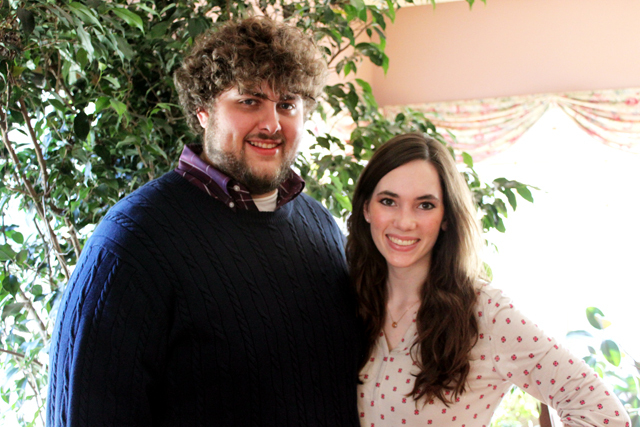 We did most of the pictures beforehand, but took a couple of Drew and I after the ceremony as well. 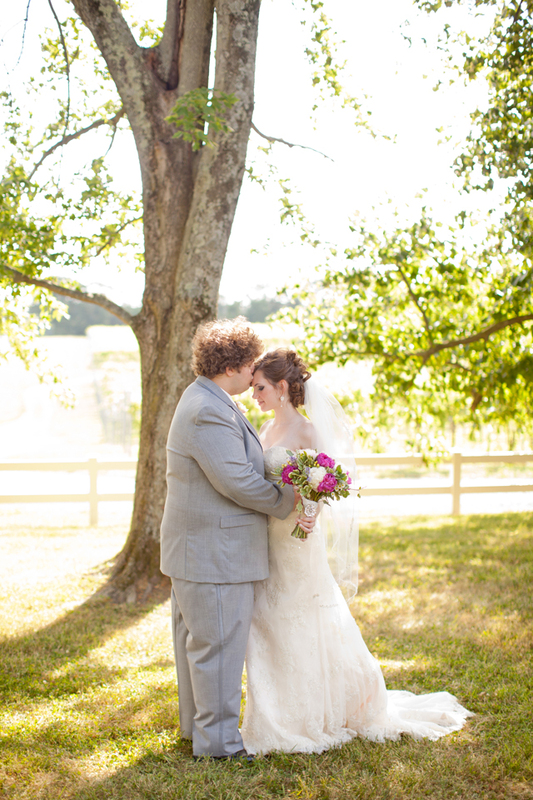 This was taken right after we said “I do” and I just love the way it turned out. 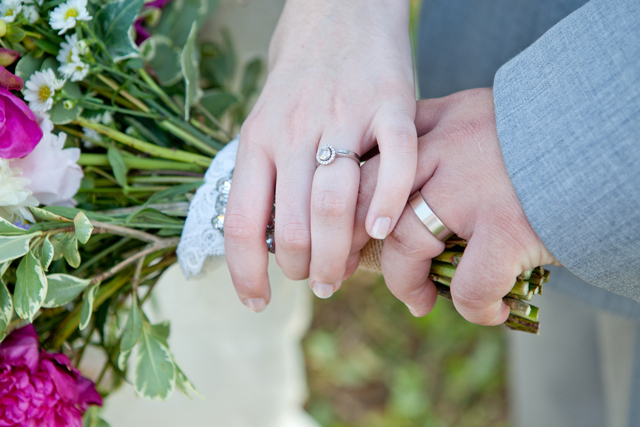 Our hands, our rings, my bouquet with my grandmother’s handkerchief and my mother’s brooch — just love it all. 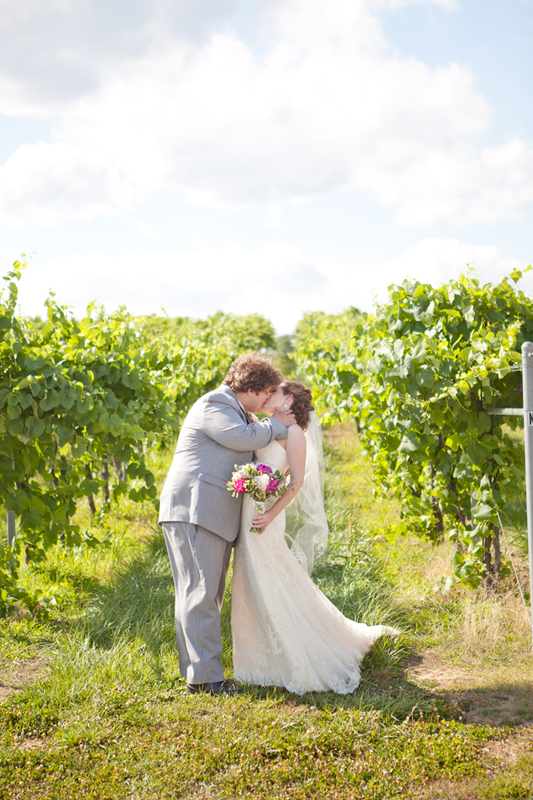 To read about our wedding flowers, check out this post. I’m finally settled back into my house after a nice visit with my family in my hometown. 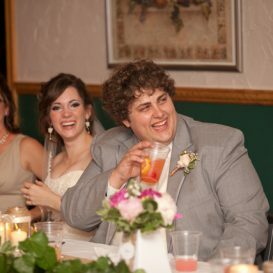 Now for the long awaited wedding series featuring our wedding pictures! 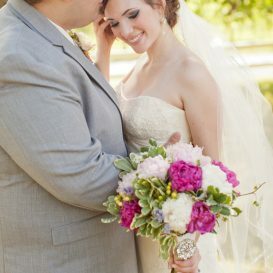 I’m so excited today to share with you our wedding flowers! 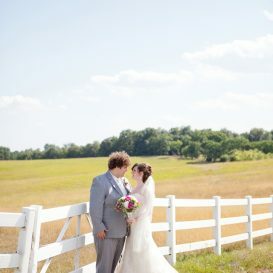 I love flowers and with a country outdoor wedding, flowers were a really important part of the wedding day for me. I wanted to use flowers that fit into my color scheme and also incorporate in things that held meaning for me. 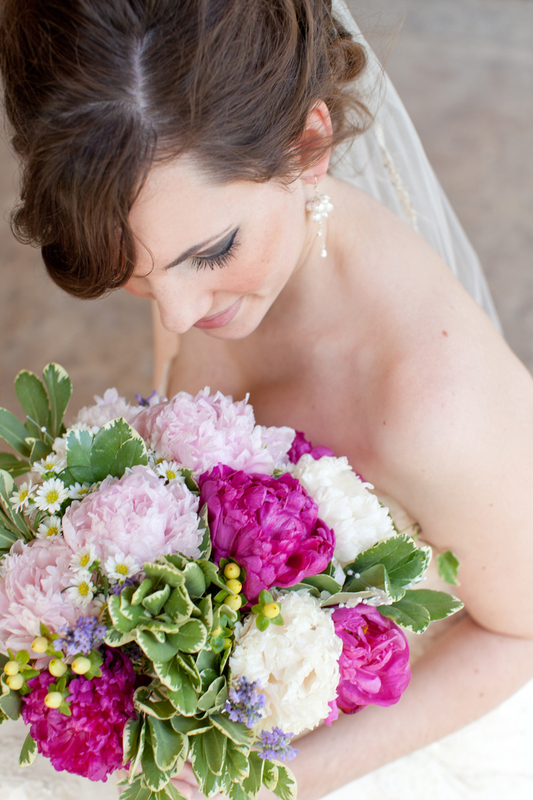 Peonies are one of my top favorite flowers, so choosing peonies for a late spring wedding was no difficult decision. I love the large size and soft, delicate look of them. 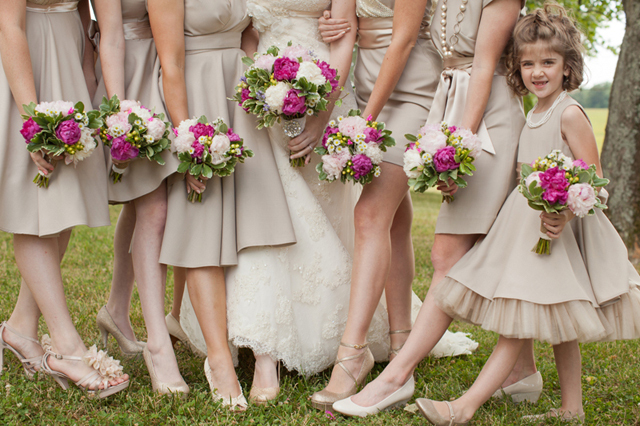 I love them here in dark pink, blush pink, and soft white colors. They also were meaningful to me as well. My mom has several peony bushes in her garden. 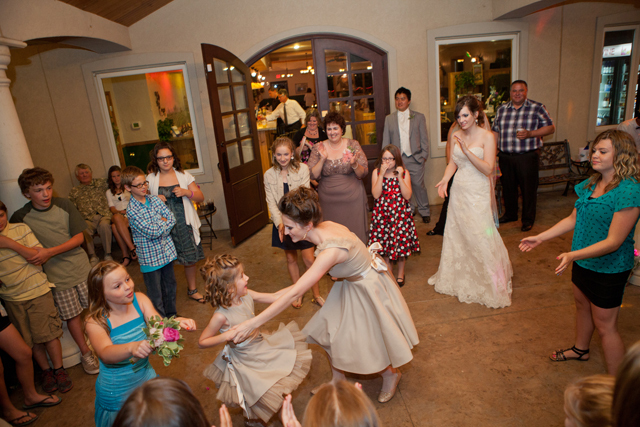 When my little sisters and I were young, we would often play “wedding” in our backyard. 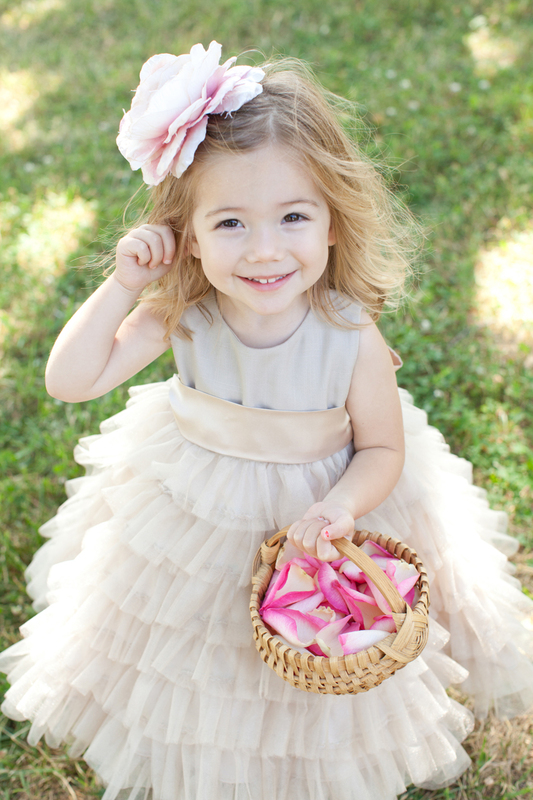 We would dress up in white dress-up clothes (an old white lace and sheer nightgown of my older sister’s) and then pick flowers out of the garden to be in our bouquets. 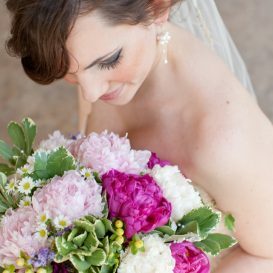 I remember picking the soft white peonies off my mom’s peony bush to use in our play wedding bouquets. 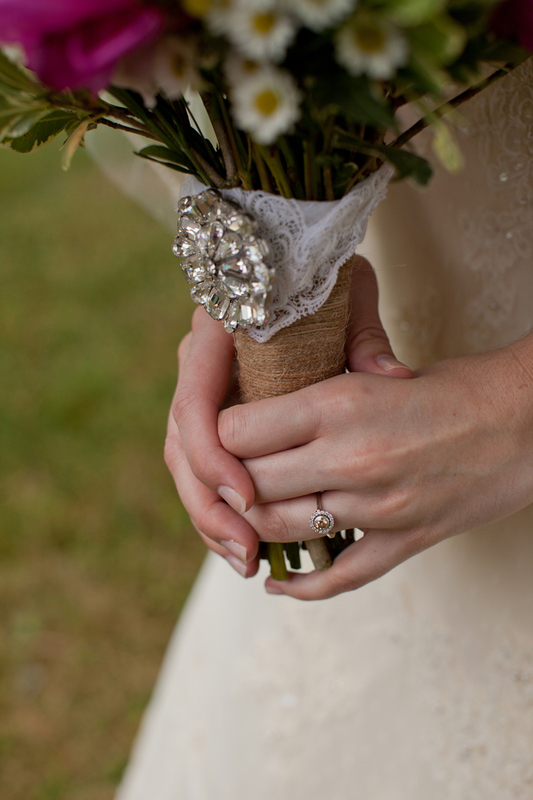 Daisies are another favorite flower of mine, so I begged my florist to incorporate those tiny little daisy-like flowers. 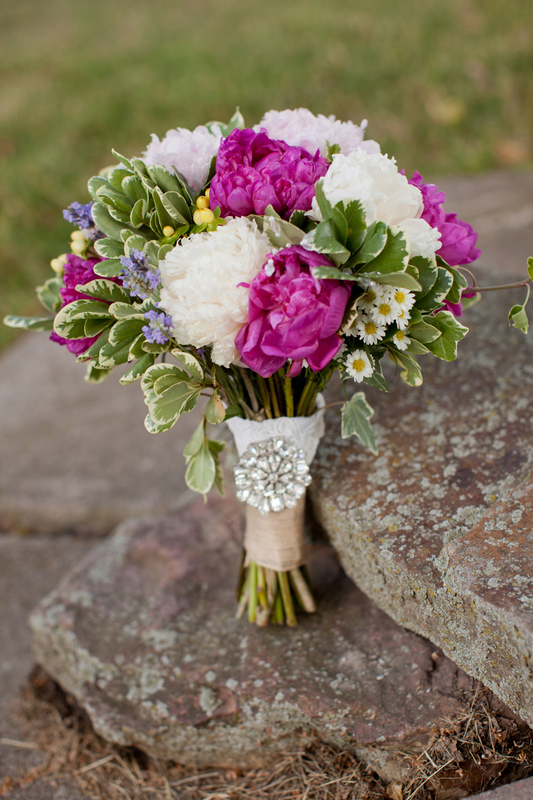 I love the country wildflower charm they add to the elegant peonies. They are actually a tiny aster called Monte Cosino. I’ve always loved the look of Hypericum berries and I love their yellow-green color and how well it accents the pinks in the bouquet. The addition of sprigs of lavender was such a sweet touch that my florist made and I love that it counted as my something blue! My mom always grew lavender in her garden as well and I remember when I was young we would use it to make lavender ribbon potpourri wands. The greenery is a mixture of variegated pittsoporum and a couple of variegated ivy stems. 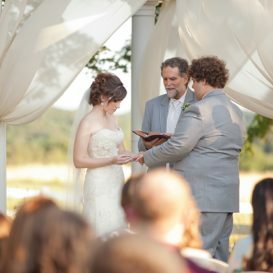 My bouquet was wrapped in burlap ribbon (I used burlap fabric for table runners on the tables and on various other things throughout the wedding) and then my Mamaw‘s lace handkerchief was wrapped around it as well. This was really special to me, as it not only counted as my “something old” but was also a sweet, simple reminder to me of my wonderful grandmother and how I’m sure she would have absolutely loved to see me on that day. I’m so happy that I had a way to include her memory into our celebration. The crystal brooch is my mother’s and was my “something borrowed.” My mom has lots of pretty brooches and I remember her wearing this one a lot when I was younger. 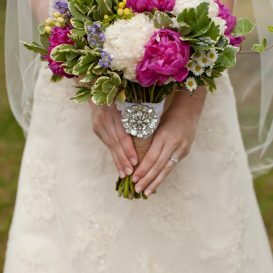 The clasp broke, so she hasn’t worn it in a while, but I’m happy we were able to secure it to my bouquet for it to hold a special place in my wedding day. 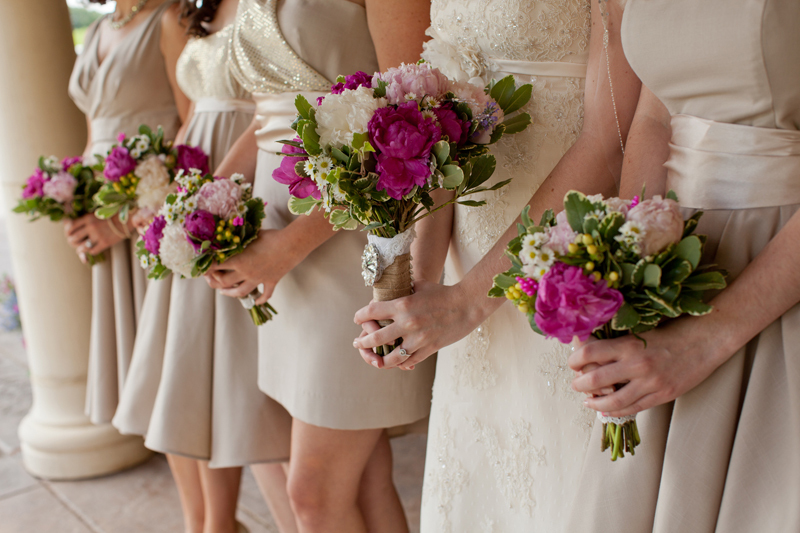 The bridesmaids all had slightly smaller versions of my bouquet, minus the lavender. 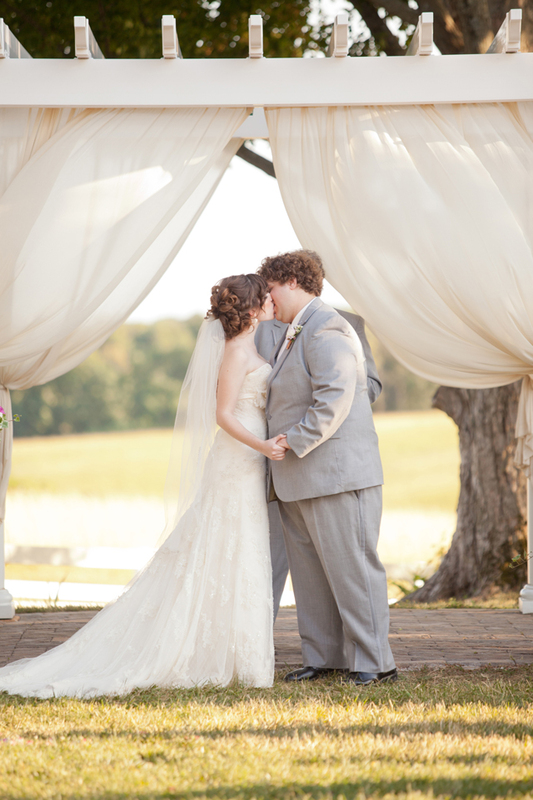 Theirs were wrapped in different bits of burlap and lace ribbons. I love how the colorful bouquets complimented the neutral dresses so well! 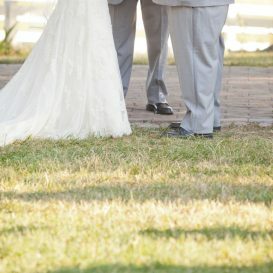 More about the dresses to come in another post! 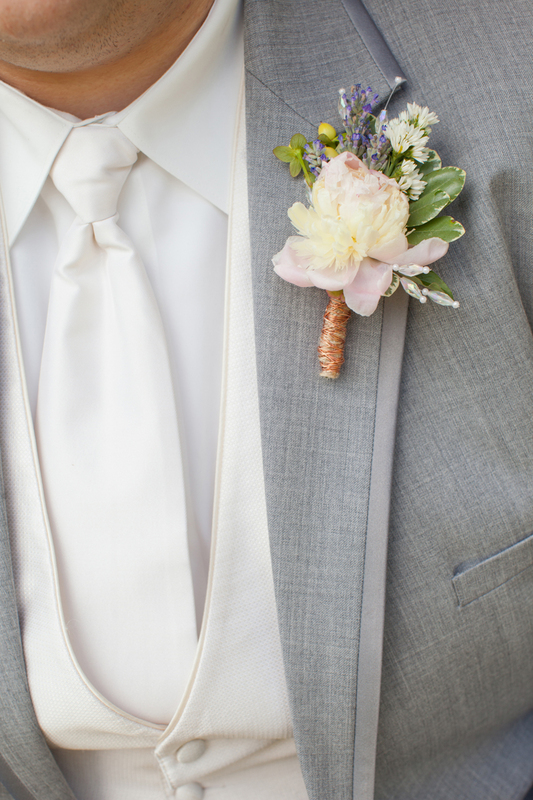 I loved the way the guy’s boutonnières turned out as well! 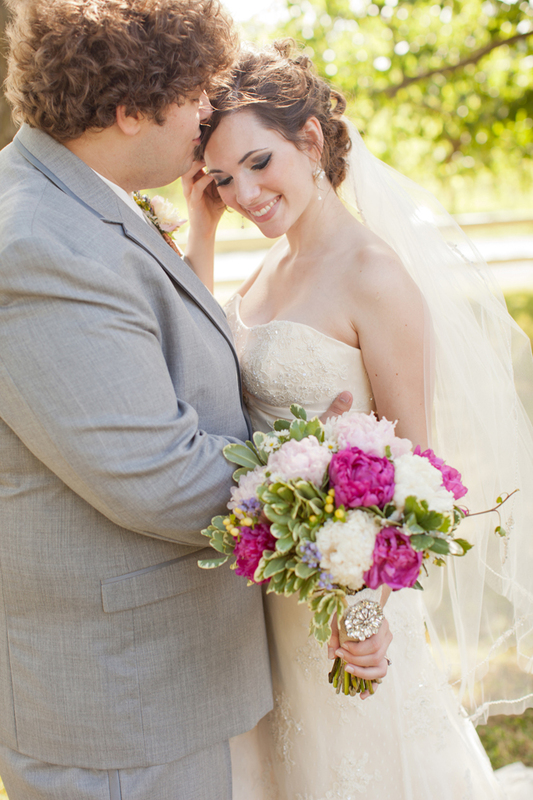 Drew’s included a small soft pink peony and was accented with the same accent flowers as the bouquets. I love that they tied into the girl’s flowers without being overly pink and girly looking. 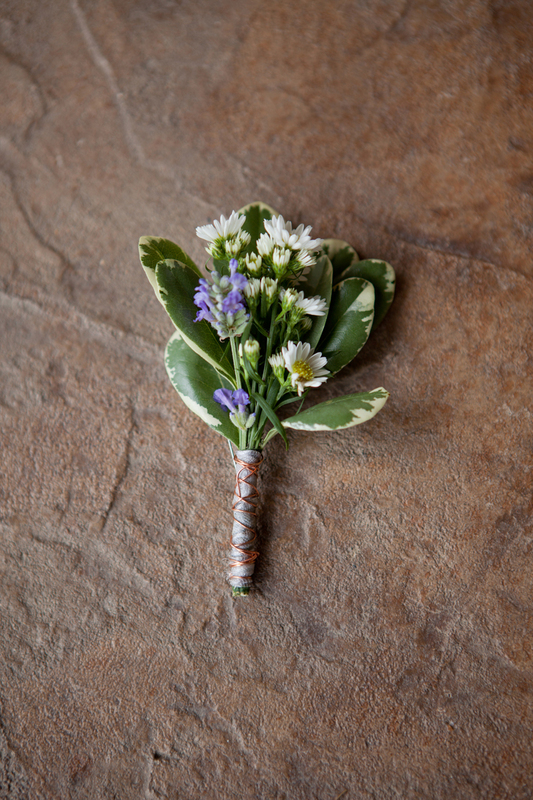 The groomsmen’s boutonnières didn’t include the peony, but simply greenery, lavender and the daisy-like Monte Cosino. 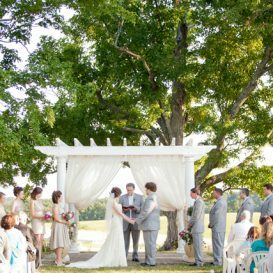 I just can’t get over how well each of the flowers used tied in so well to our elegant but simple country outdoor wedding. I think matching flower types to the theme and scale of the wedding is really key. The boutonnières for my dad (he was also the minister), my grandpa (who walked me down the aisle), and Drew’s father were different from the others as well. 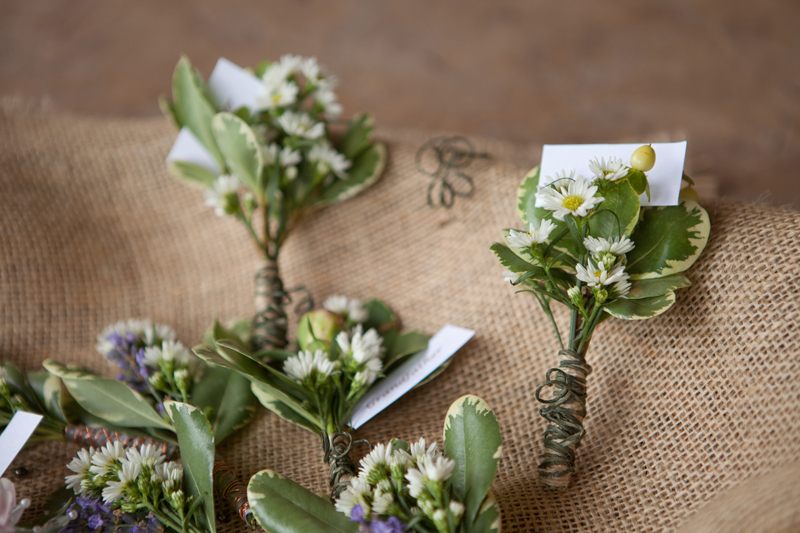 They included greenery, the daisy-like Monte Cosino, and the Hypericum berries. 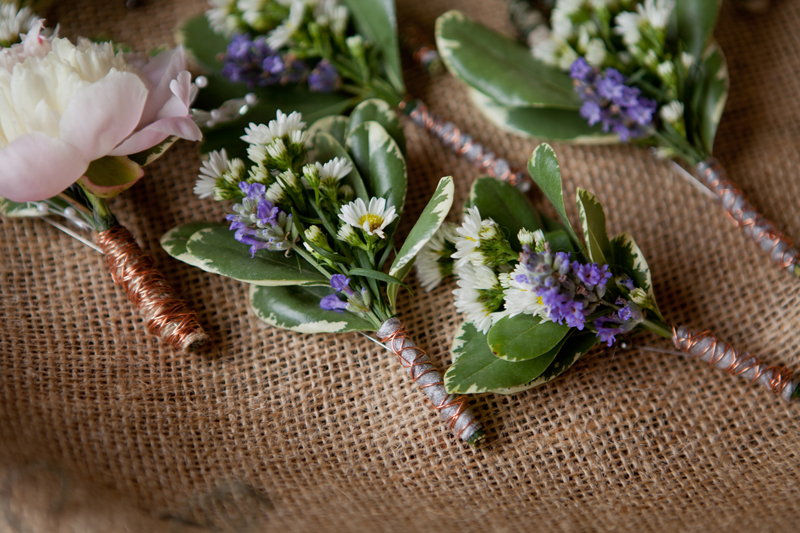 I loved how all the boutonnières went together so well, but were also slightly different for different people in the wedding. So beautiful, huh? 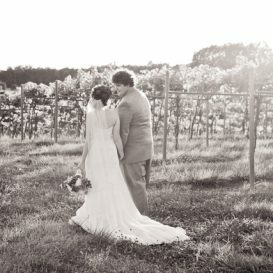 I can’t stop looking back over these pictures and re-living our wonderful wedding day! I’m so happy with how these turned out and how special they were. 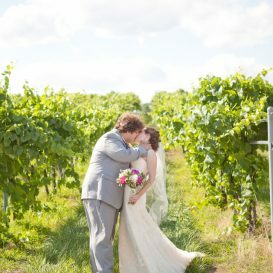 Can’t wait to show you all the other wedding pictures, including flowers we used on the tables and to decorate the winery! 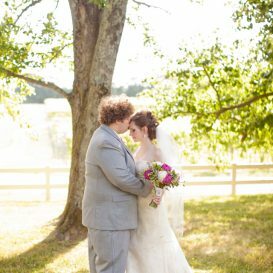 If you live in the Southern Illinois area and are in need of a wonderful florist, I highly recommend Nadine Williams of Flower Ridge Farm, she does excellent work! Check out her Facebook page, here, or send me an e-mail and I can give you more contact info for her. All pictures taken by the wonderful Stephanie Milligan of Stephanie’s Photography. 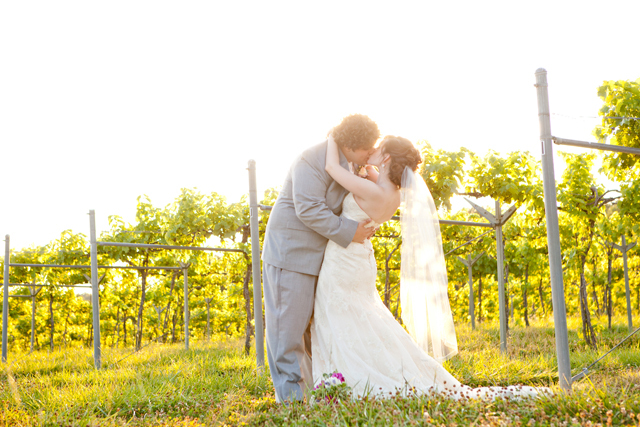 I highly recommend her as well if you are in need of a wonderful photographer! Check out her website, here. We received lots of lovely wedding gifts. I thought this gift, made by my brother and his girlfriend, was too cute an idea not to share with you all. They gave us two glass jars filled with Popsicle sticks. On the sticks in one of the jars, they had written out different date night ideas and the other was full of blank sticks for us to come up with our own ideas and write them down. I love the things they put on them. 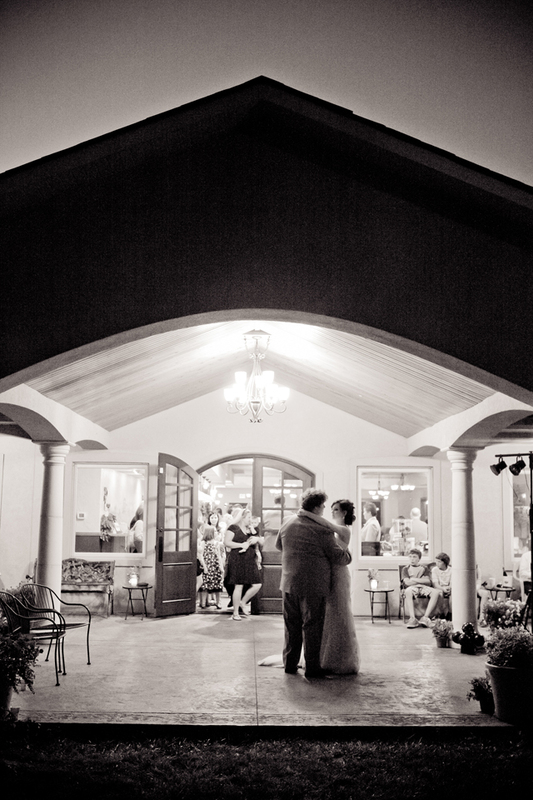 Most are cute, simple, inexpensive (or even free) date night ideas. Things like “Go on a picnic!,” “Go get ice cream,” “Cook together,” & “Drive out into the country and stargaze.” I love that they even personalized some specifically to New Orleans, like “Take a cemetery tour,” “Visit The Chart Room,” & “Do something touristy.” I love that we can set aside specific date nights and then just pull out one of the sticks to figure out what to do! I’m not sure if it was planned or not, but the color they painted the jar lids and the ribbons even matched my wedding color scheme. How sweet! Such a sweet gift and a cute project to do for a friend, give as an engagement or wedding gift, or even a gift to someone already married. 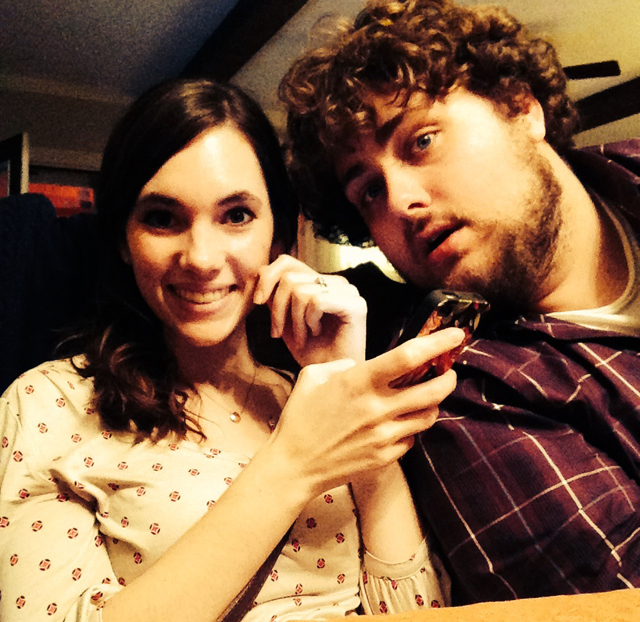 It is always important, especially after being in a relationship for a while, to still remember to have date nights. 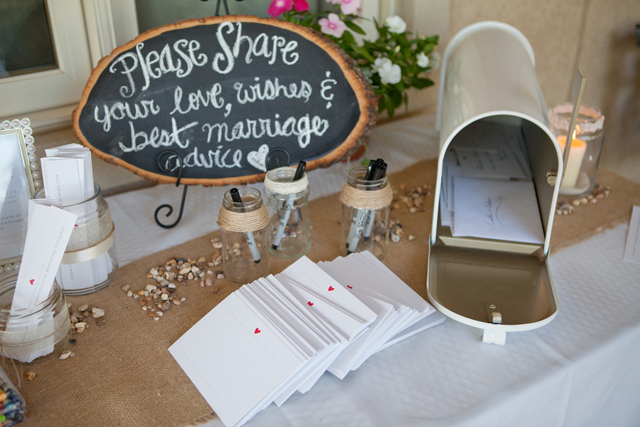 It would be a fun bridal shower activity, having each of the guests write down date night ideas for the couple. It would even be fun to do this project with kids for family trip ideas. 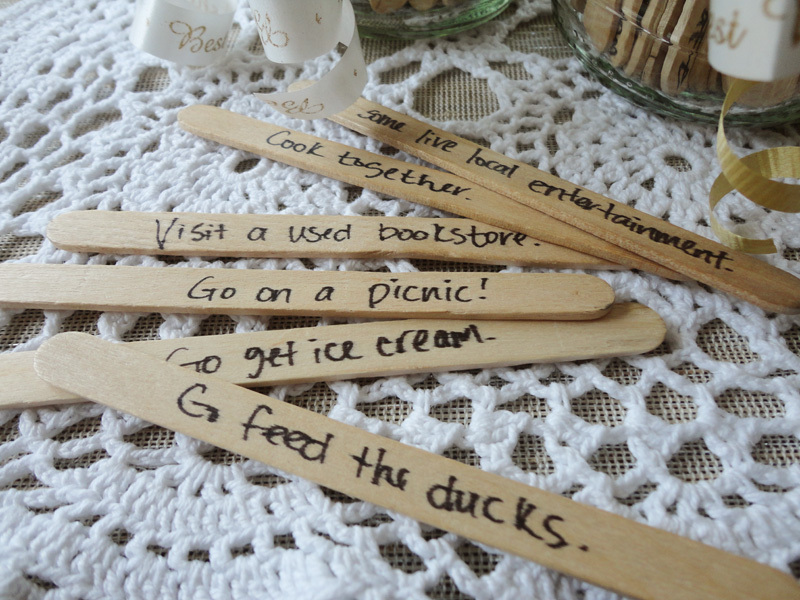 There are lots of fun activities to do with kids and I’m sure they would love helping to color on the Popsicle sticks! We’ve made quite a few changes to our bedroom in the last month! Of all the rooms in our house, it was probably the room that we had decorated the least since we’ve lived here. 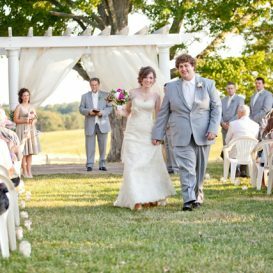 I’ve had plans for a while, that after we got married, we would makeover our bedroom to make it feel more peaceful and relaxing and make it more “us.” So, as soon as we got back from our honeymoon, we got started on it! First, we decided to paint the walls. Our landlord told us when we moved in that we were free to paint any walls, as long as whenever we moved, we left the leftover paint/paint can so he would have the color to get more paint mixed for future touch-ups. The existing color wasn’t horrible, but every room in our entire house is painted that color (except for the bathroom and laundry room which are both white). 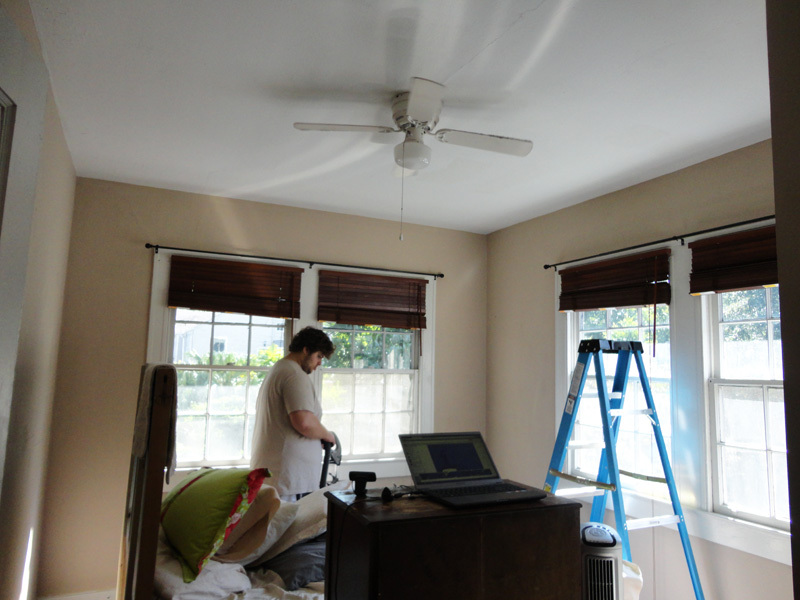 We really wanted to change up the color a bit and since our bedroom is a relatively small room, we thought it would be an easy room to change up with paint. Our bedroom also doesn’t get a ton of sunlight because of the dark wooden blinds on the windows (that are necessary to keep all of our neighbor’s porch/house lights out of our faces while we sleep), so we wanted to lighten the room up a bit with the new paint color. 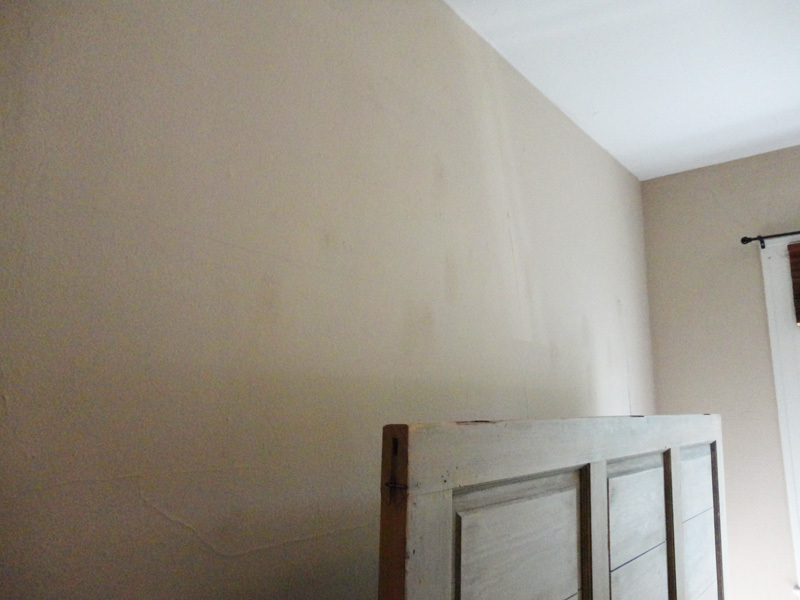 Here you can see how splotchy the wall looked before we painted it. It had been touched up many times over the years and all the touch ups stood out. Here is our room all cleared out (except for the bed and dresser in the middle of the room) and ready for paint! You can see in this picture that even though we have all the windows open and more sunlight is coming in than normal, the wall color still looks kind-of dark (and a little too orange-y for my taste). After we got the walls painted, before we even started to bring our stuff back into the room, I noticed something else I wanted to fix while we were at it — our headboard. 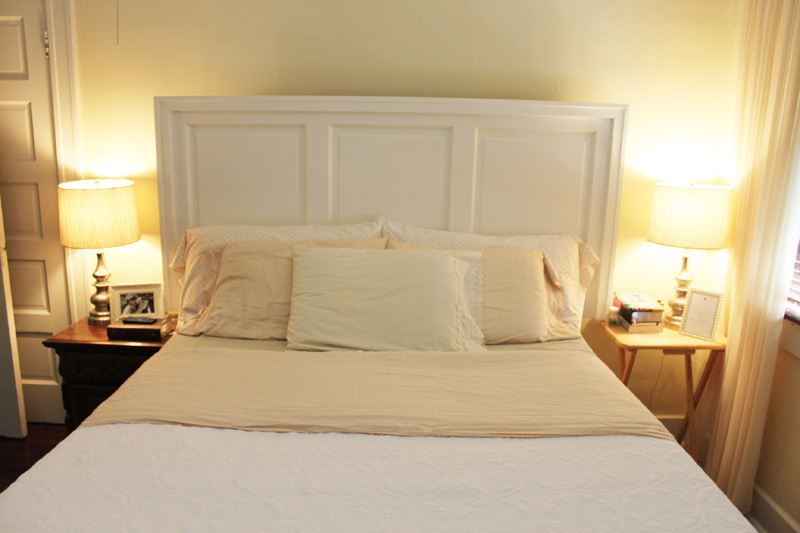 You can read all about how we got and attached this old door to our bed frame in this post. 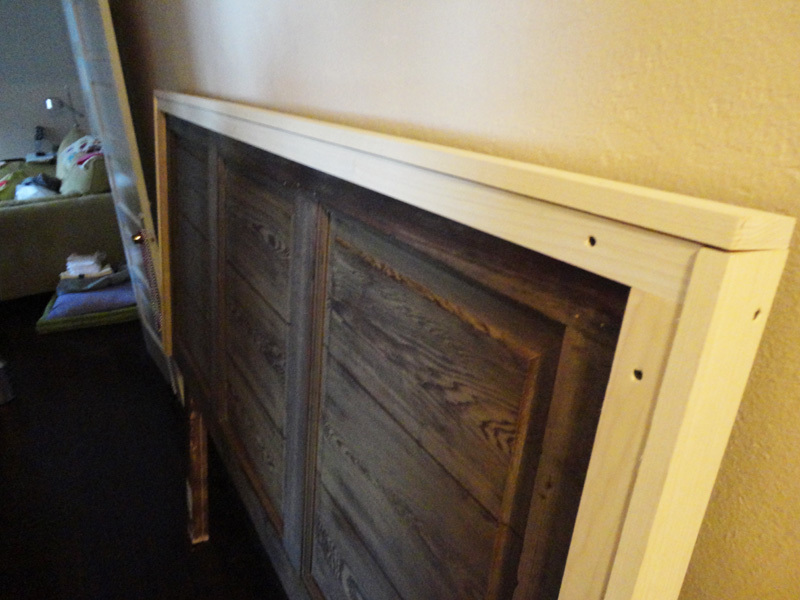 We had lived with our old door headboard in its natural state for about 8 months and I finally decided it was time for a change. Overall, the character of the natural wood in the door was interesting, but the color really clashed with the darker wooden blinds and darker wooden dresser in the room. It just looked really dingy and dirty. In a different house somewhere, it might have looked more shabby chic, but to me, in here, it just looked shabby. I thought painting it would be the best idea, since I thought it could benefit from lightening up, but I figured I should at least try staining it first, so I could be sure that painting was the way to go. 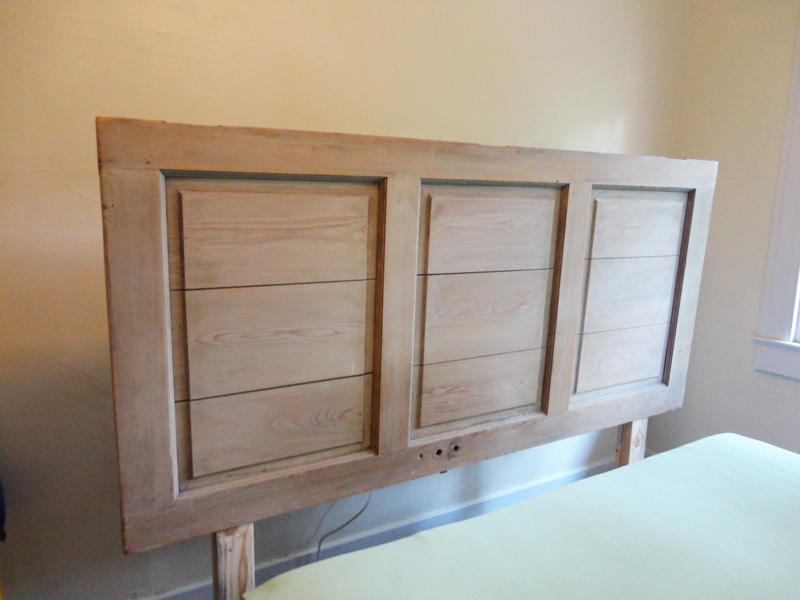 It is always easier to paint over something than to strip painted wood back down to stain it. Instead of a pretty rich wooden color like my desk, this old door soaked up the stain completely different and just looked horrible. Some parts were kind of reddish, but most of it turned a darker grey color. I thought this new look just make it look even dirtier. So, on to painting it was. Before painting it though, I decided that we should add a little bit of molding to the old door to make it look a little more “finished.” I had always wanted to do that and even mentioned it in this original post about the headboard, here, but we never added it because we had left the wood plain and if we added molding out of a different type of wood than the door, we knew we would have to paint it all to look seamless. So off to Lowe’s it was to look for wood. 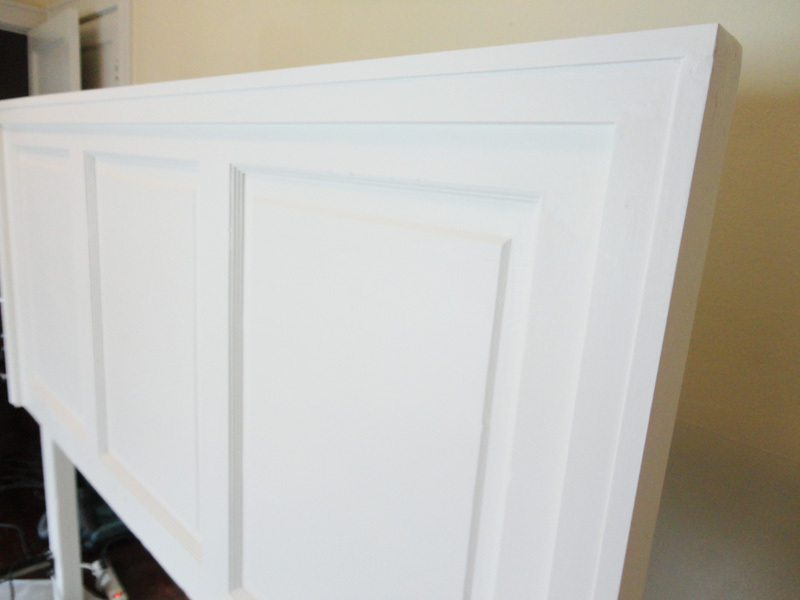 We originally thought about putting crown molding along the top of the door, but in order to do that, we would have had to buy more power tools to cut the molding correctly. I also kind-of thought it would add too much of a traditional feel and I wanted something a little more simple. 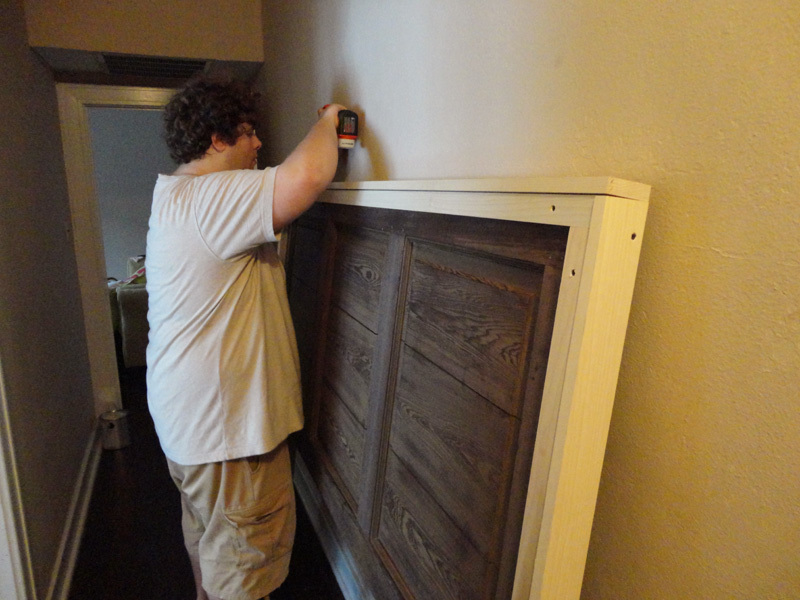 We decided instead on just a simple trim using 1x2s and 1x3s to frame out the top and two sides of the door. Then onto our next set of challenges. Usually when we’ve bought wood for other house projects, we’ve just had the people at Lowe’s use their saw in store to cut our wood down to the sizes we needed. This time, however, we went to two different Lowe’s and both of their saws were out of order. We don’t have our own power saw because we don’t really have room to store it and we’ve never really had to have one before. Luckily though, Drew got a jigsaw from his grandma as a wedding present and we thought we might be able to get all the small, straight cuts we needed for this project from that. Once we got our wood home and took all our supplies outside to make the cuts, we realized that the outside of our house doesn’t have any plug-ins. We didn’t have an extension cord long enough to reach out our second story window to the front yard either. As a last resort we even tried to use the converter box in Drew’s car to plug the saw in, but it didn’t give out enough power to run the saw. So, we were left with having to make all the cuts inside the house. Luckily, the saw worked perfectly to make the cuts we needed and it didn’t actually create as big of a mess as I thought it would. We were really only left with a minimal amount of sawdust from the wood. Thank goodness. 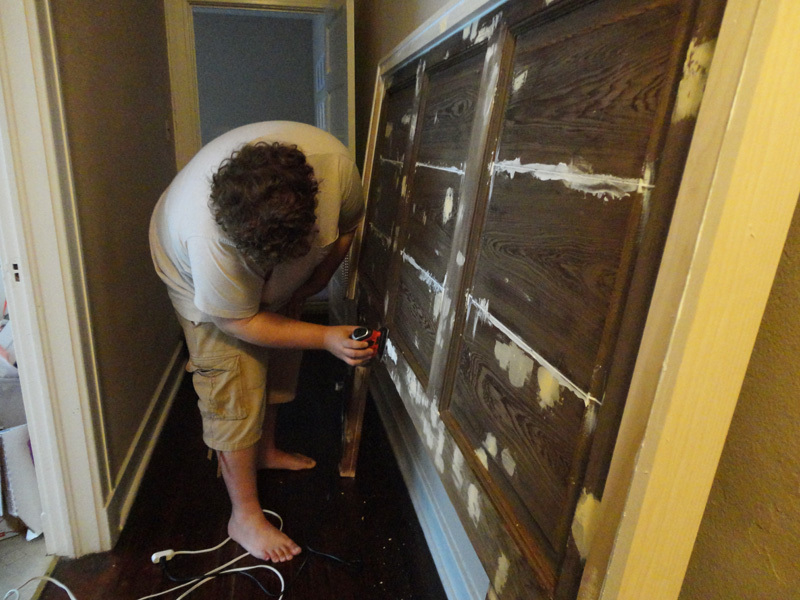 We brought our headboard and wood into the hallway and set up shop there to get this makeover started. For our makeover, we decided to add 1x2s to the front of the door on the top and both sides, then add 1x3s to the outside of the top and both sides as well. 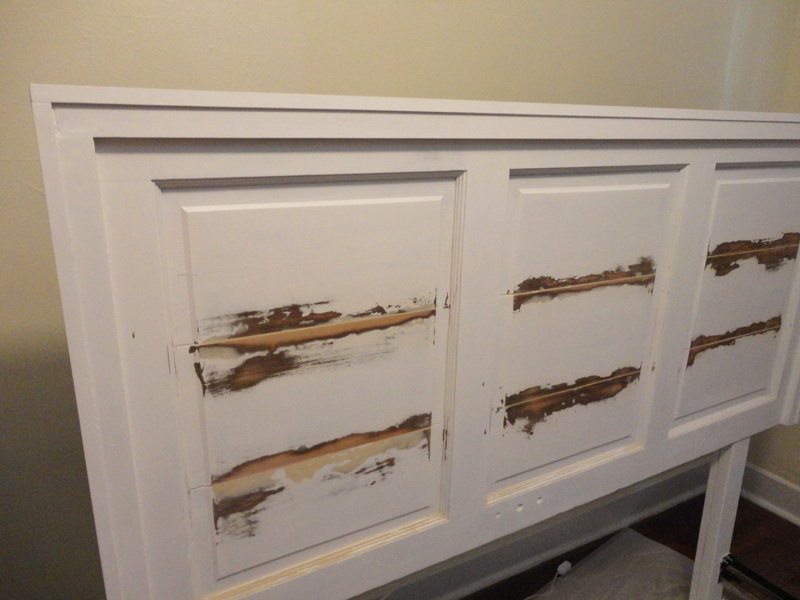 The top of the door headboard before had some notches in it where the door hinges used to be and was old and worn and not at all straight and finished looking. We basically just wanted to frame out the door a little more to give it a more finished look. We let the 1x3s on all the sides come out over the 1x2s about a quarter of an inch or so for a layered, stair-stepped look. After getting all our trim attached it was time to get all the holes puttied up and the seams caulked for a smoother, seamless finished product. Sometimes things have to get a little uglier before getting better, right? Then we had to sand everything down to make it smooth again. 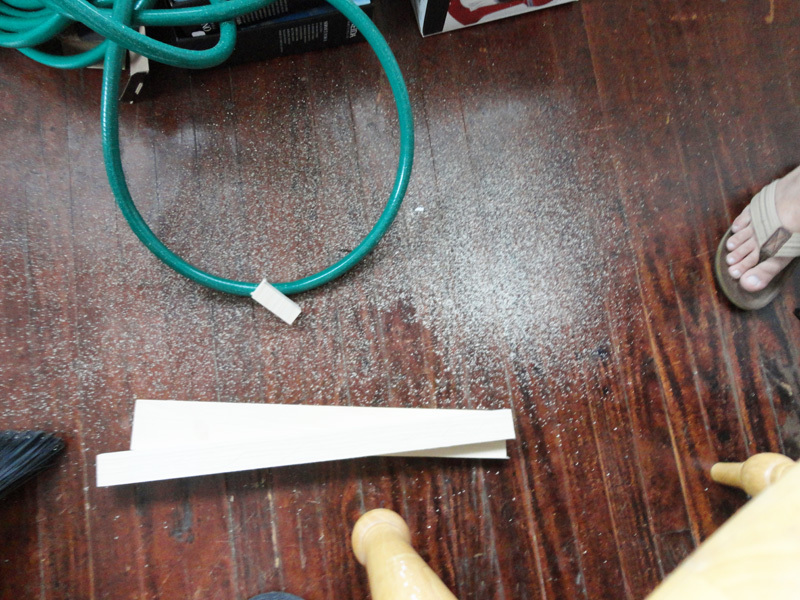 Side note that we learned from this project — caulking is not sand-able like wood putty is. It doesn’t sand down smoothly, it just balls up and peels off, so if you use caulking for the seams, make sure you have them perfectly smoothed out with your finger before letting them dry. Lesson learned. I wish I could say that the sanding step went just as smoothly inside as the wood cutting, but it did not. 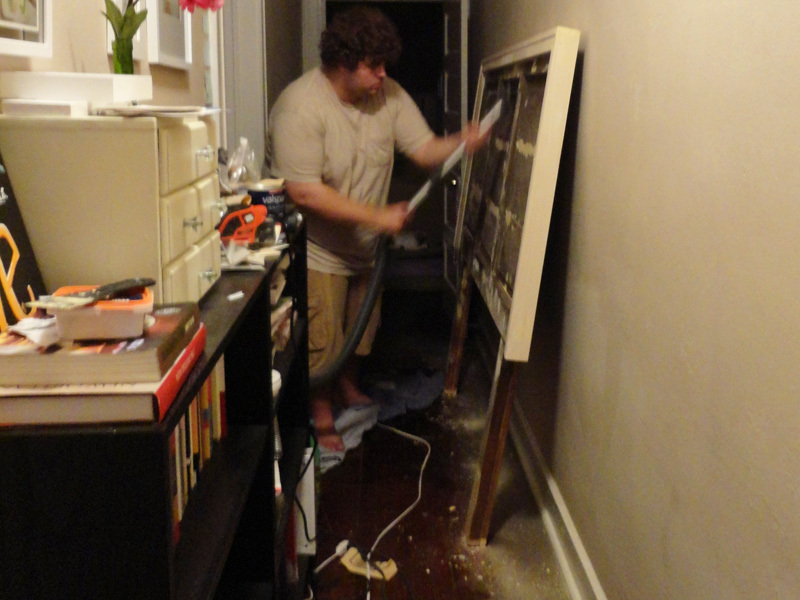 Sanding makes a mess, so hopefully if you attempt to make a project like this, you have outside plug-ins. If not, prepare yourself for a really dusty house and have your vacuum cleaner nearby to keep the mess under control. 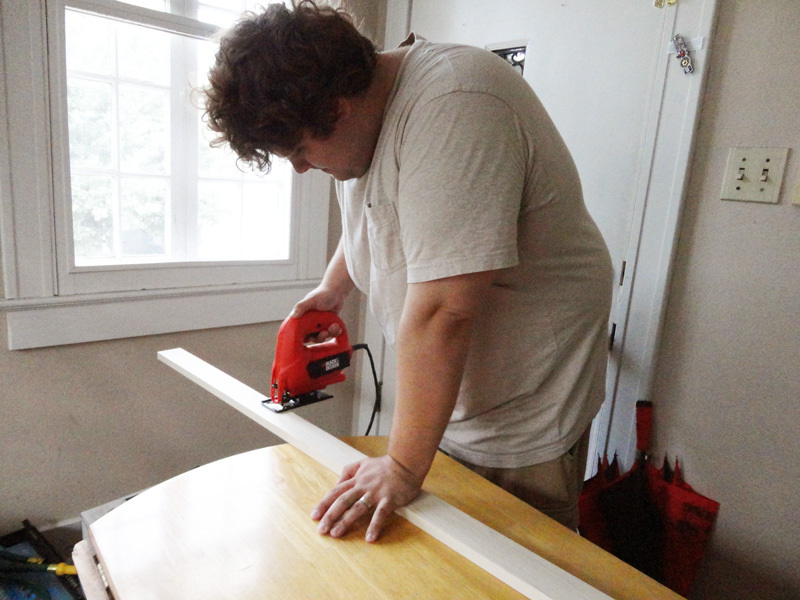 After all the sanding, we re-attached the door to our bed frame to make it easier to paint. 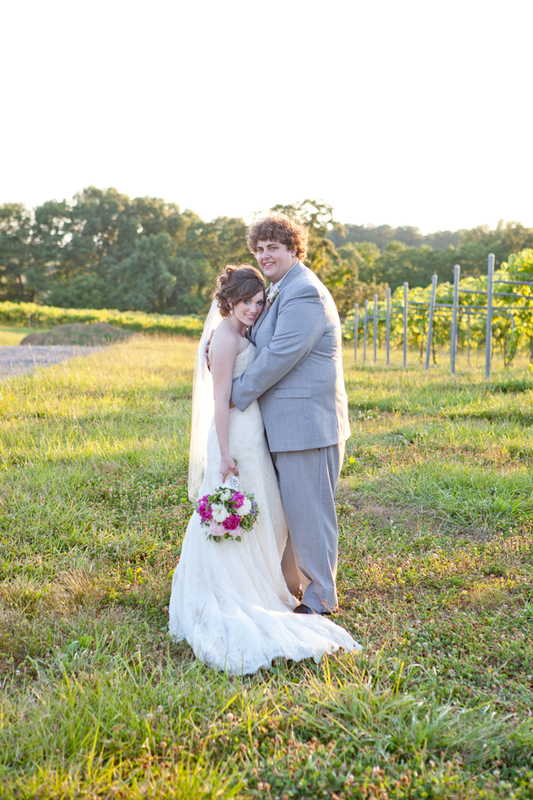 I chose a soft, warm, white paint, called “Wedding Bells” (how fitting!) from Valspar at Lowe’s for the door. I just got a quart and again it was paint and primer in one so it worked well for this project. I worked late into the night to get the first coat of paint on. 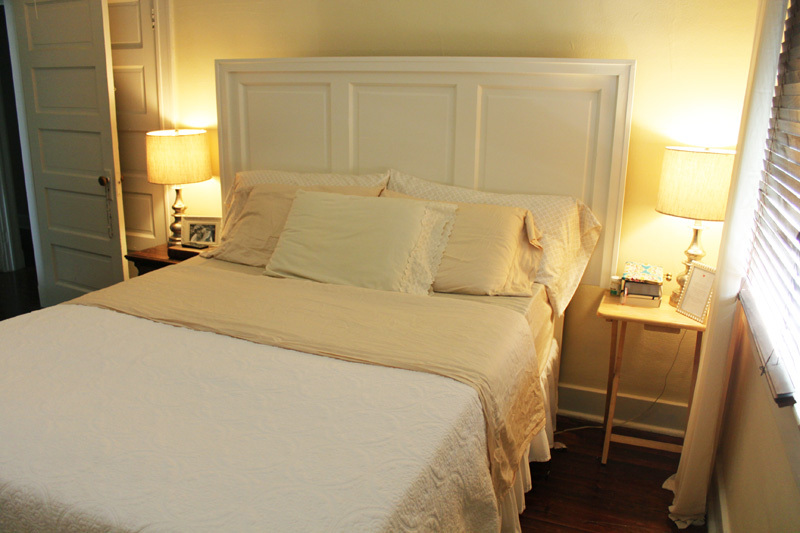 (We had to sleep on an air mattress in the living room for a week while we were painting the walls/staining then painting the headboard in here, so we were anxious to get this project finished and be able to get back in our own bed!) 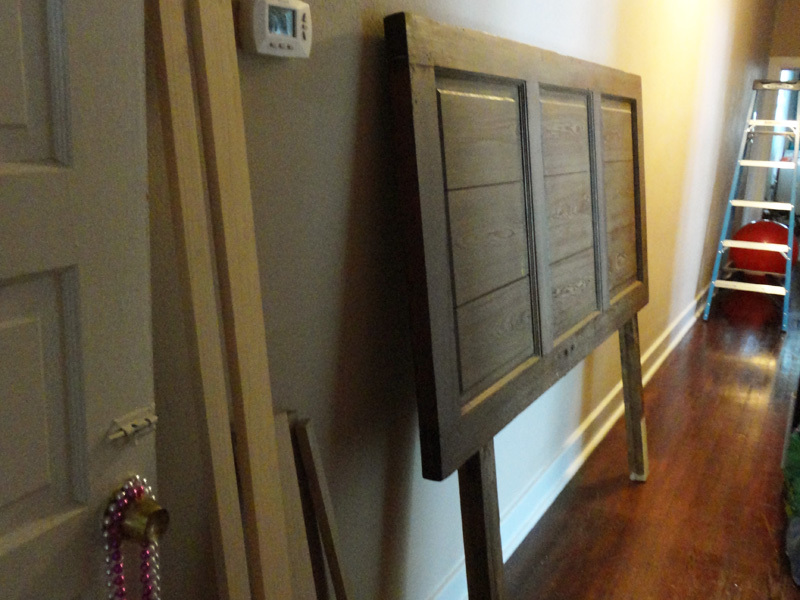 Once I was finished with the first coat and stepped back, I was a little dis-heartened. 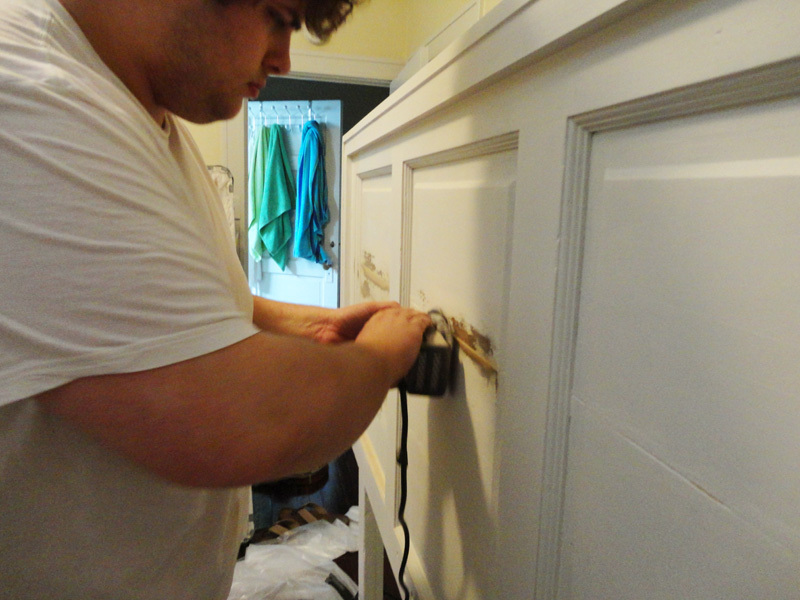 Our sanding job on the seams in the wood of the door was really bad and made the whole project look like crap. So the next day, back to sanding it was. Unfortunately, that meant we had to get yet another part of the house messy and covered in dust from the electric sander. But in the end, making sure that all your holes and seams are sanded smoothly really gives a much better looking product in the end, so it was all worth it. 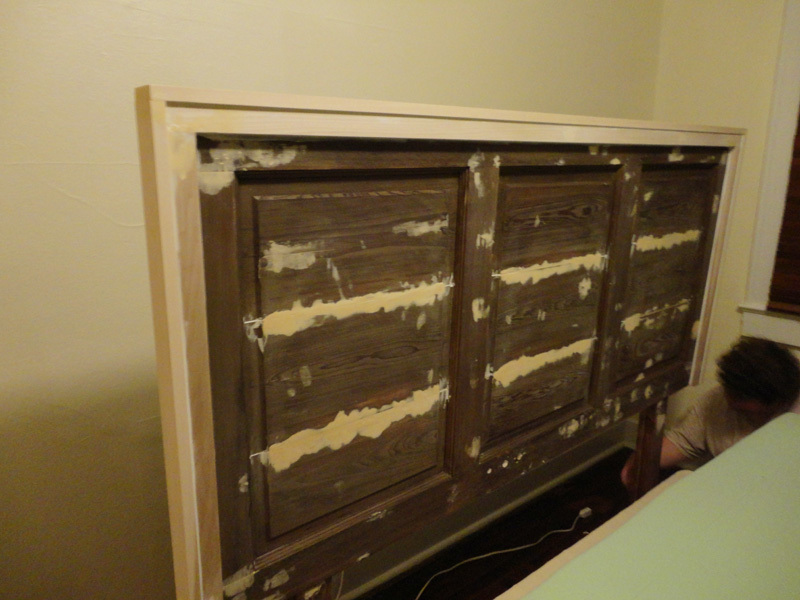 I also ran (by hand) a piece of fine grit sandpaper along the entire surface of the headboard as well. It is always essential when painting wood furniture that you lightly sand between the first layer of primer/paint for a smooth finish in the end. It really makes a big difference. 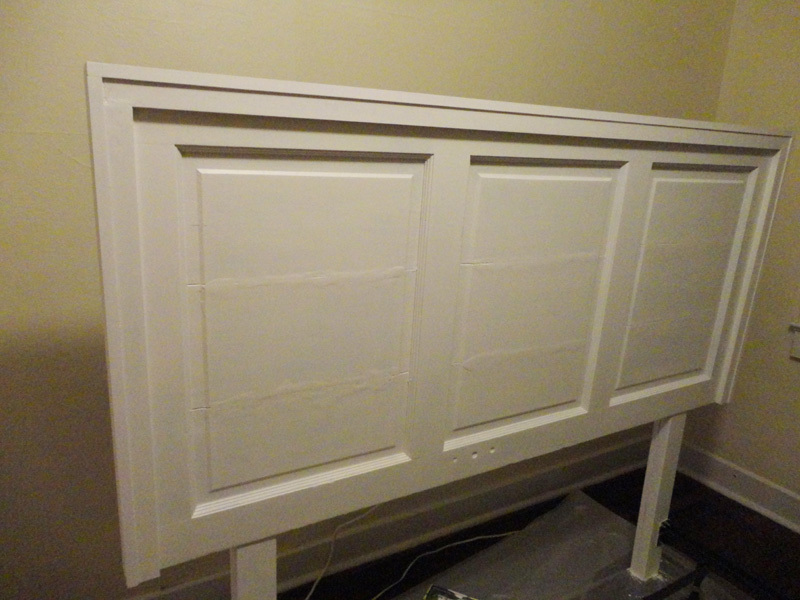 Finally, two more coats of paint later (and a little extra on the seam parts since the first coat was sanded off) we were left with a pretty, clean white headboard! 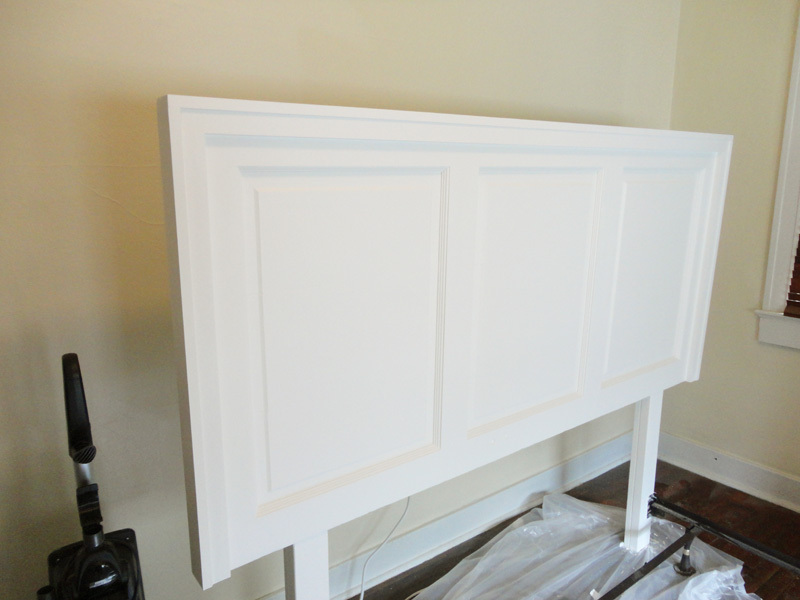 I am really impressed by the transformation that the extra molding around the edges and the crisp, white paint added to this headboard! It just looks so much more crisp and clean. I love the updated look. So simple and pretty. Ready to get to some real before and afters? It makes the room feel so much lighter and airier! I also think it makes the room feel a little more young as well. 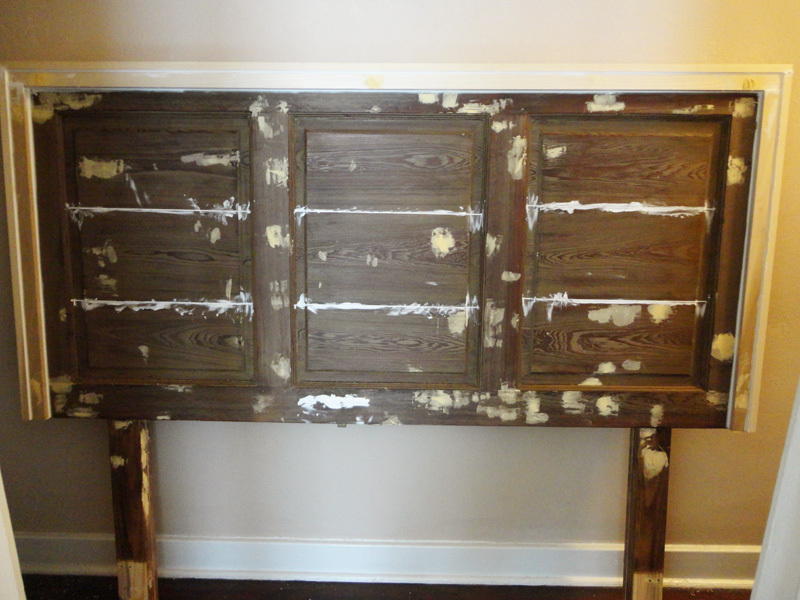 I love taking something old and giving it a whole new life and purpose! As you can see, we have still yet to find the right side tables for in here. I’ve been on a search like a madwoman for them! I just can’t find what I want (for an affordable price!). 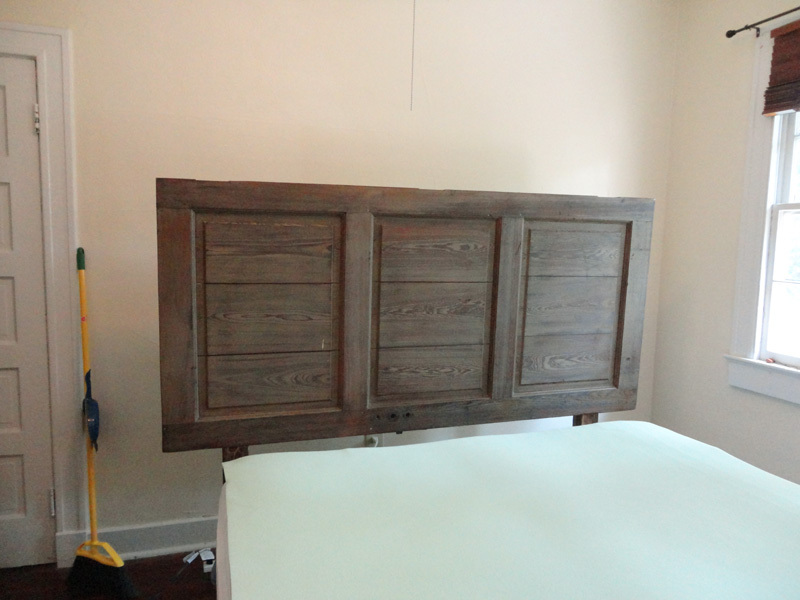 Plus the headboard is slightly larger than the bed and hangs over about 6 inches on each side, meaning I have to find sidetables that fit underneath it, so the tallest they can be is 26 inches high. We also have some new bedding in here as well. The previous mattelasse that we had on our bed (in the before picture above) was from my dorm room a couple years ago and was a full size (meant to hang far over a super tall twin size college bed). It was pretty, but too small for our queen size bed. 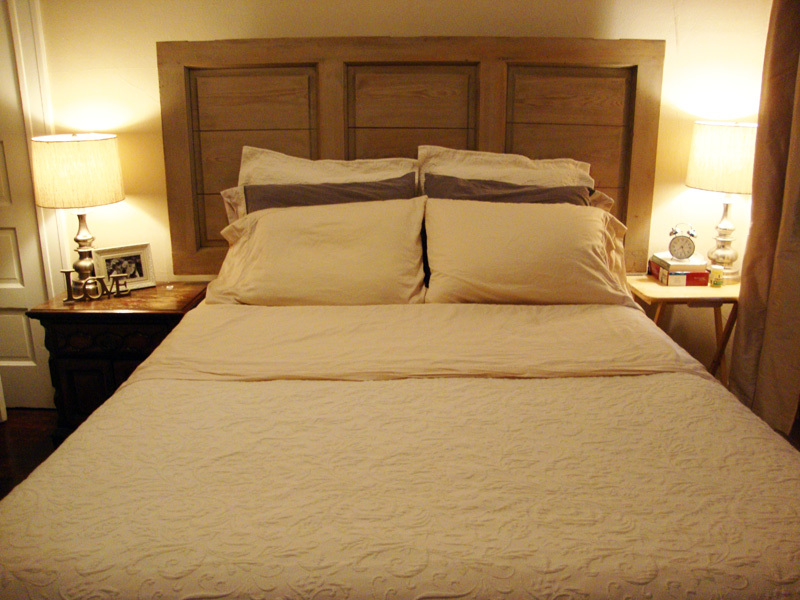 I prefer my coverlet/comforters to hang farther over each side of the bed, so we really needed a king size coverlet. 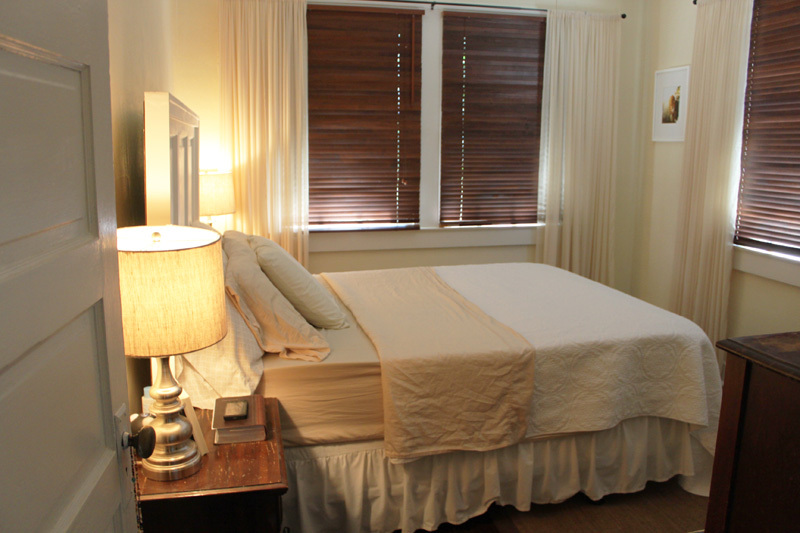 It was also ivory, and I really wanted white to go better with our new light and bright bedroom feel. Over a year ago I posted about Restoration Hardware’s bedding with a rose window design on it that I loved. 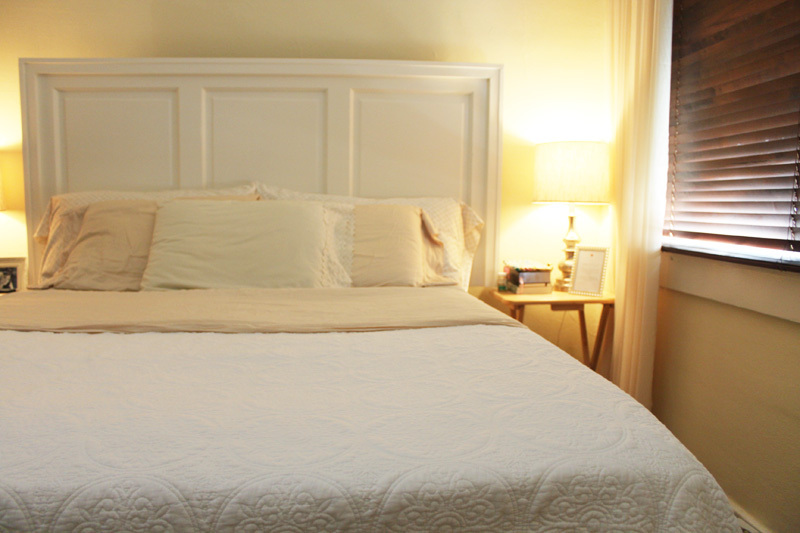 At $279 (without tax or shipping) for the coverlet alone, it definitely wasn’t in our bedroom bedding budget. 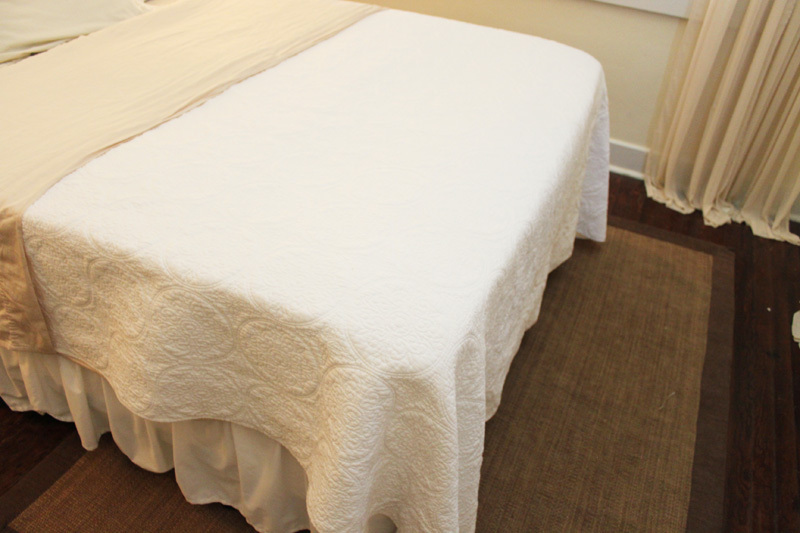 However, while shopping at Marshall’s the other day, I found this king size white coverlet with a really similar design for just $49! It is so soft and much lighter than our old mattelasse, which is great because Drew is a giant heater at night. I really, really love the circular rose window design on it, better than the one from Restoration Hardware actually. If you look closely you can also see little fleur-de-lis’ in the design as well! Perfect for our life in New Orleans! Drew hated the pillow shams that matched our mattelasse before, so with the new coverlet, I decided not to buy any matching pillow shams. Instead, I decided to go with king sized pillows in back, with two standard sized pillows in front. I love the layered look that adds without putting too many pillows on the bed. The king sized pillows fit perfectly across the width of our bed and I think they also make it feel a little wider as well. They are also nice for an added cushion behind my back when I’m sitting in bed doing my bible study at night. 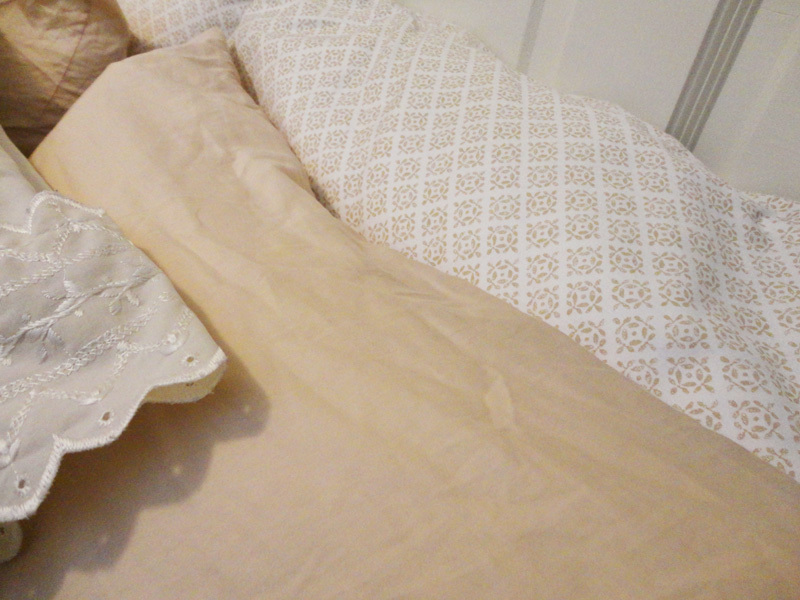 The white and cream patterned pillowcases are from Target. 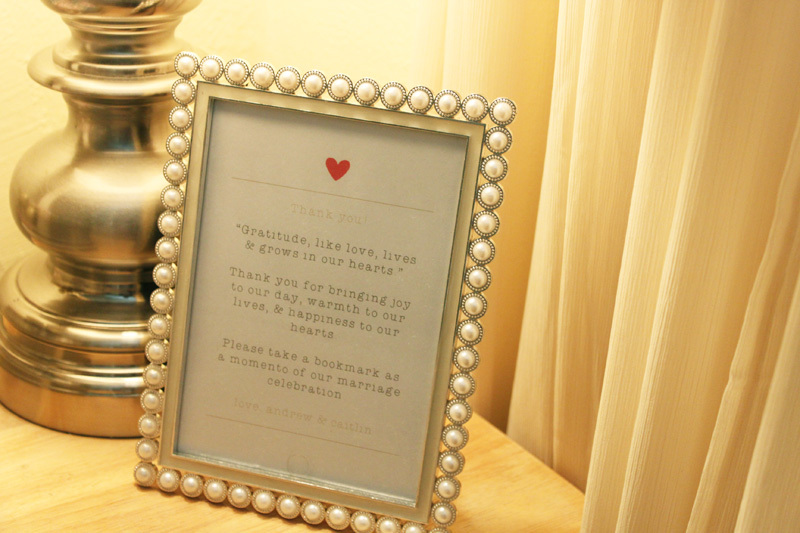 Another addition to my bedside table (and an up-close view at the curtains) is this picture frame (on clearance from Wal-Mart) that we used on the guest sign-in table at our wedding. It goes with the colors of the room perfectly! 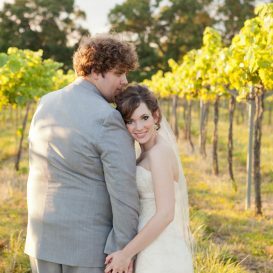 I can’t wait to print out one of our wedding pictures to put in there. Overall, I love the changes we’ve made to our room in the past few weeks! The wall color (although much more yellow than I expected it to be) makes the room a little brighter and cheerier, the rug is great, the curtains look much better in here than our old ones, I love the new bedding and pillows, and I absolutely love our made-over headboard! Next on the list in here are definitely side tables, re-finishing Drew’s dresser, new sheets (already on this — the current ones are looking a little too orange in here now) hanging a big wedding picture above the dresser, and possibly new table lamps (the ones we have are from Drew’s old apartment and aren’t really my style and don’t really go in here — when the lights are off, the shades are grey which clashes with all the white, brown, and creamy yellows in here). We’ll get to all that eventually! 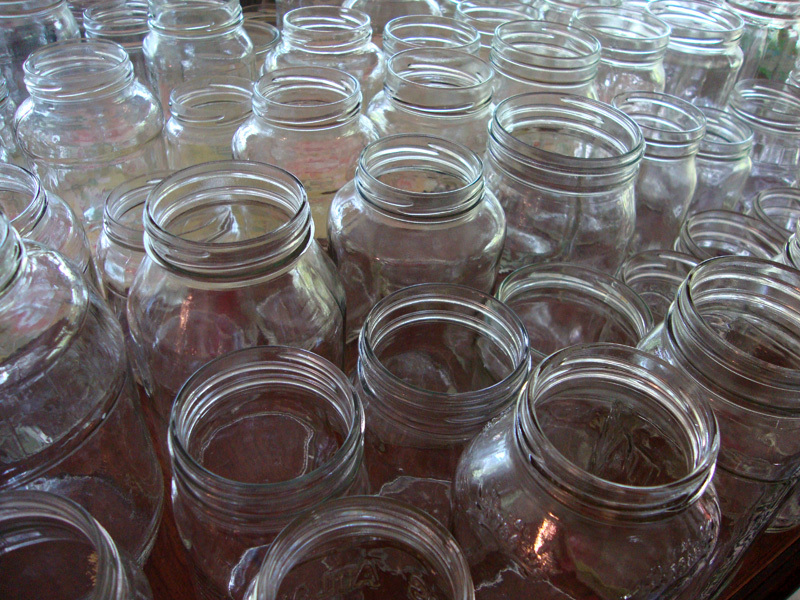 One of the biggest decor-related projects that I did for the wedding was decorate tons of glass jars for candles to be placed in on tables around the winery for the wedding reception. The next part was fun and it was a nice time I got to spend with my close friends/bridesmaids the week before the wedding. I had a big collection of different types of ribbons, laces, trims, burlap ribbon, jute twine, etc and a few hot glue guns and we just glued and decorated to our hearts content. Since we had over 150 of them to decorate, we just kept it simple and didn’t worry about having them perfect or anything. We did make sure that if the jar had a logo or name or anything printed on it that we covered that up with ribbon or something. I think they turned out really pretty! 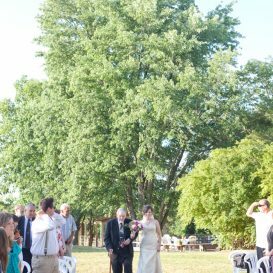 On the morning of the wedding, once we had them all out at the venue, we filled them with a couple inches of sand and then placed 2×3 inch ivory pillar candles (ordered from here) in them. We scattered them randomly all along the tables inside and out and they looked so, so pretty lighting up the evening. Not the clearest picture to show you how they looked, but you can see how they let off a beautiful glow both inside and out. 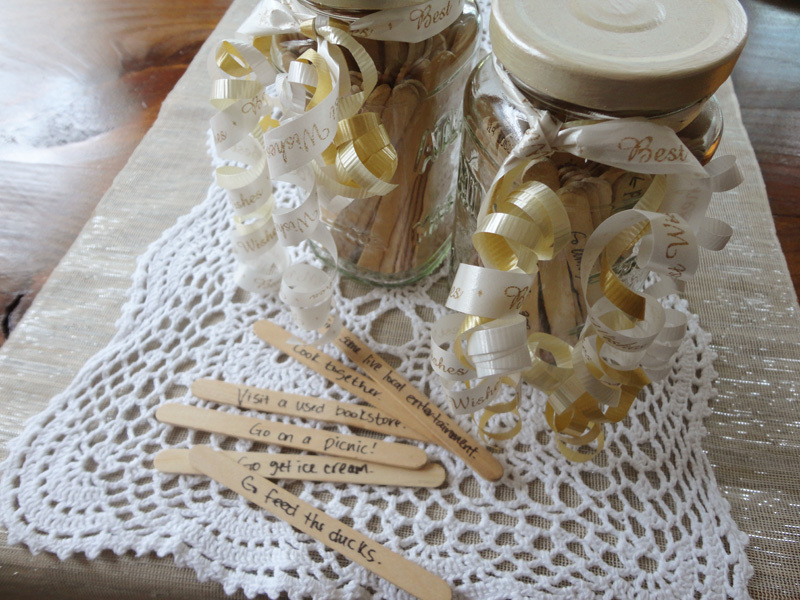 We also used a couple of the decorated jars to hold bookmark favors, pens, and ribbon streamers on the guest sign-in table (pictures of that from the photographer too hopefully!) I loved the way they turned out and the best part is that a few of them are great to display around the house with candles or something else in them as a memento from the wedding! Even if you aren’t getting married anytime soon, this would still be a cute project to do a few to decorate a porch, sunroom or deck for an outdoor summer party or to use to put candles inside the house too. 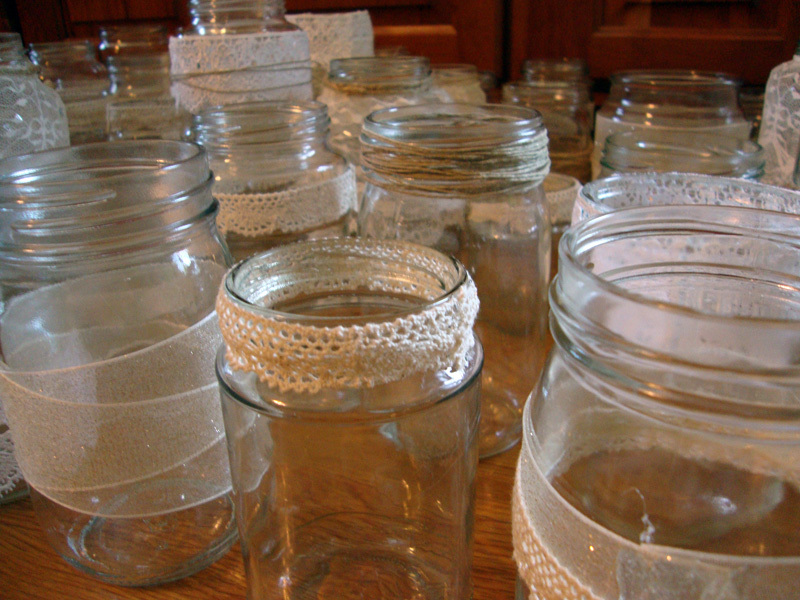 A great way to re-use all those leftover glass food jars!